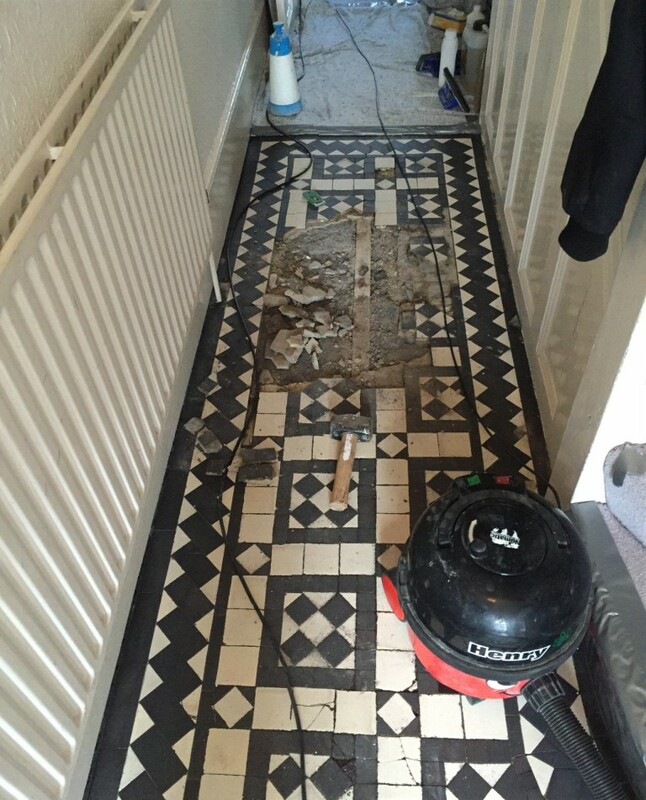 A customer in Winchmore Hill which is part of the London borough of Enfield was having major refurbishment works done to their home which included an upgrade to the central heating system. 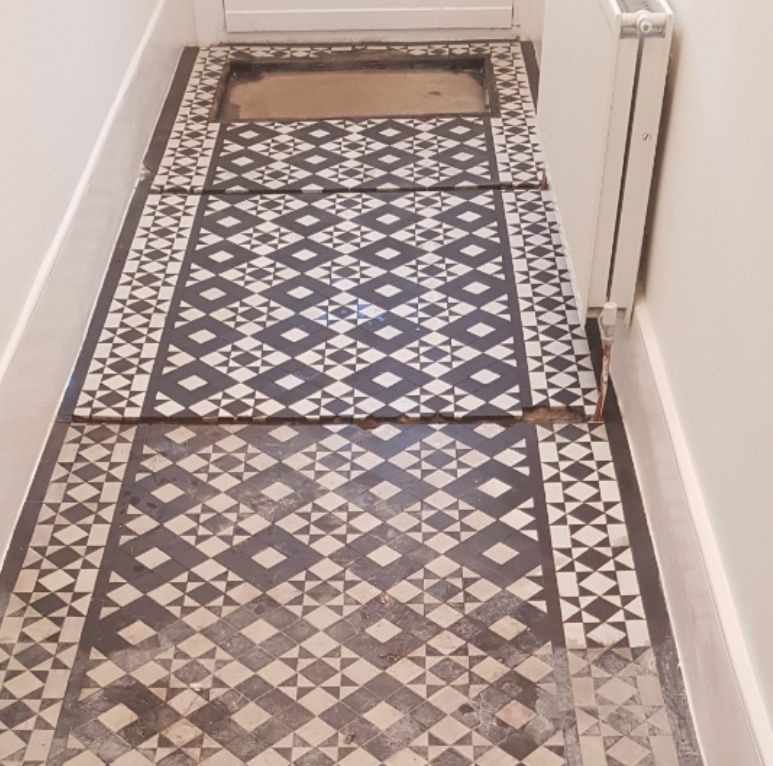 As part of the work a new radiator had been installed in the hallway however the utility company when putting in the new heating system had chased out two deep pipe channels in the central part of their beautiful Victorian tiled hallway floor. 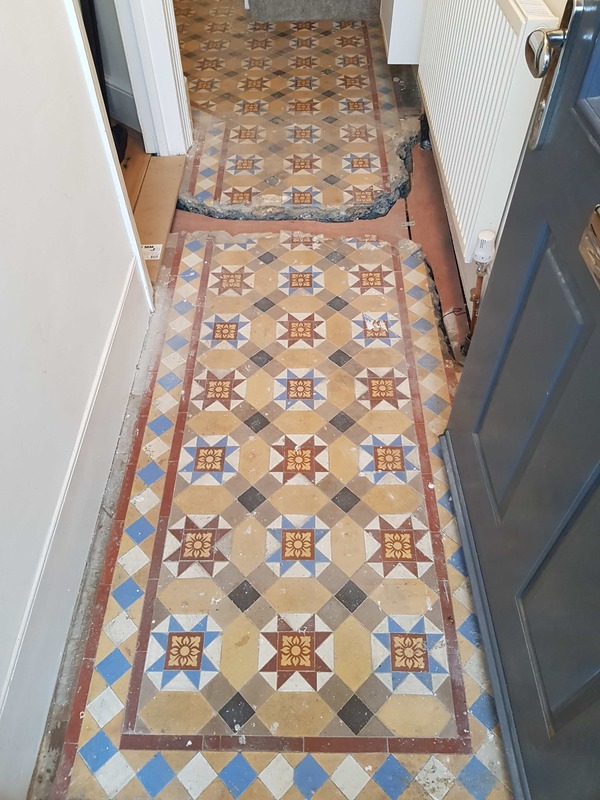 This was a real shame as the majority of the floor was in good condition; the owner of course wanted the floor restored so our brief was to do exactly that and carry out repairs to the pipe channels and to all the door thresholds that were either existing or new so they all matched in. 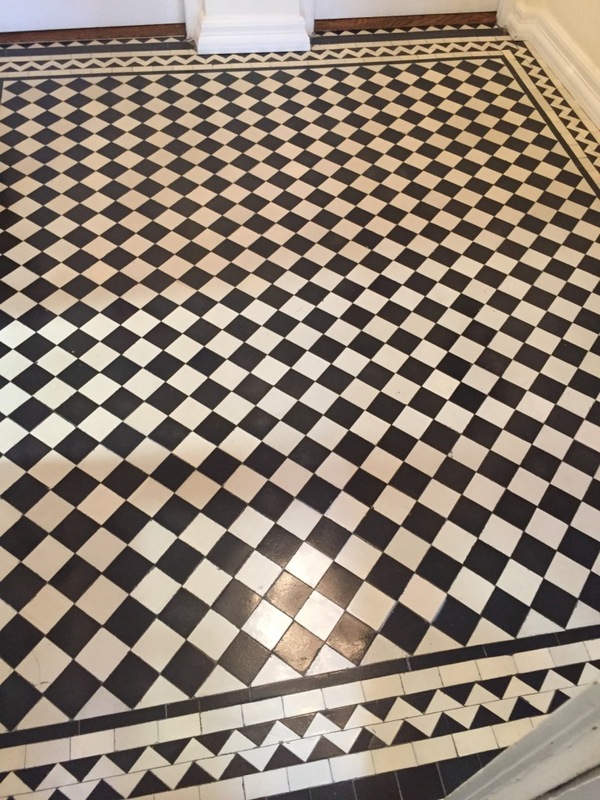 Our first task was to clean the tile and grout and strip off old sealers and waxes which we did by applying a dilution of Tile Doctor Remove & Go combined with equal part of Tile Doctor Pro-Clean. 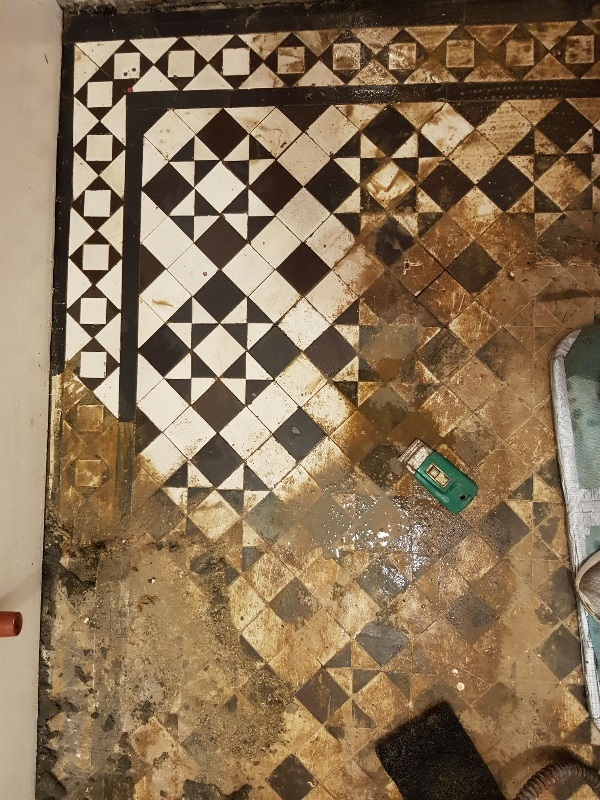 This was scrubbed into the floor with a black scrubbing pad fitted to a rotary machine and then rinsed off with water and extracted with a wet vacuum. 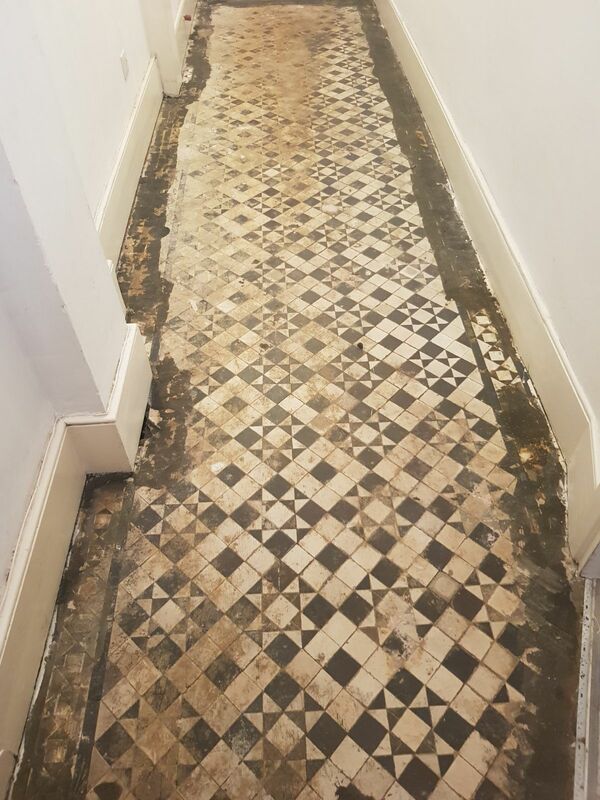 After deep cleaning we then carried out the tile repairs and replacements to pipe channels, missing and mislaid tiles to thresholds. 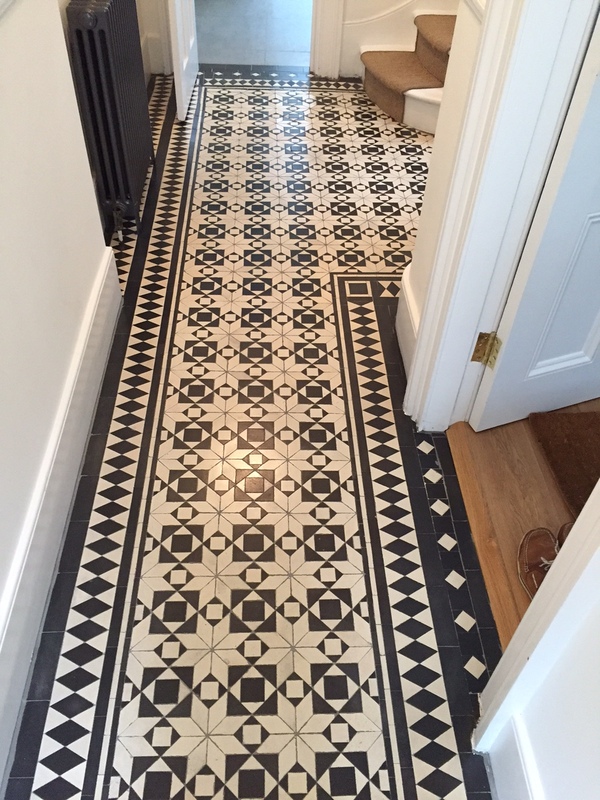 Some or the tiles were replaced with matching reclaimed tiles and others were new sourced from Original Style who have a large range. 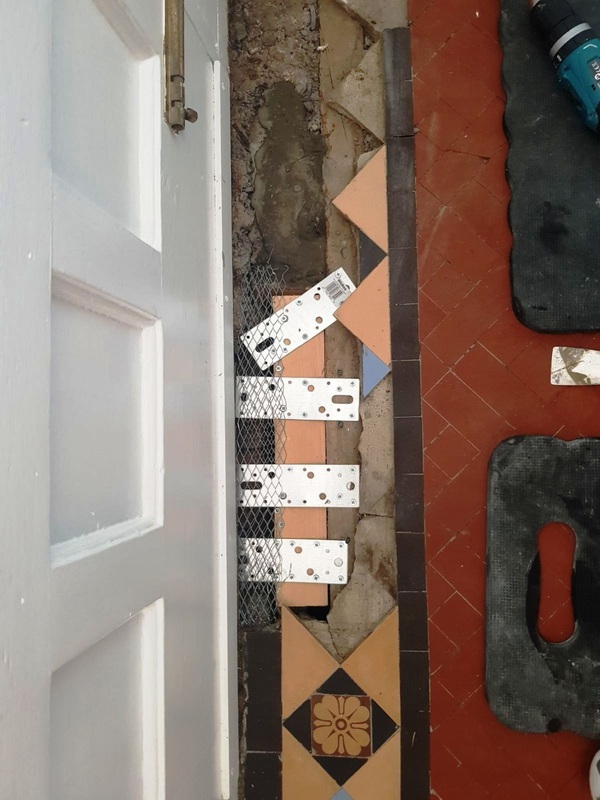 Altogether we replaced circa 500 pieces of tile in order to repair the damage caused by the heating engineers and achieve a consistent pattern throughout the hallway. 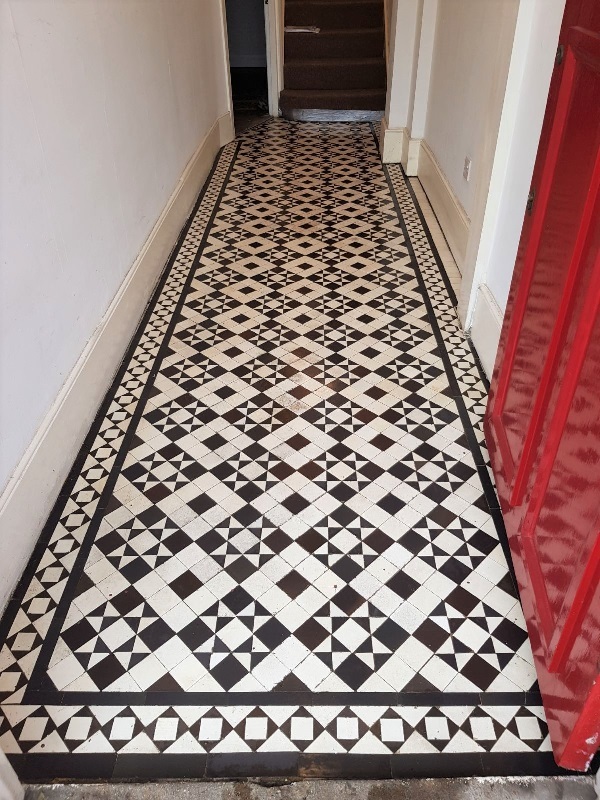 The cleaning and re-tiling work was carried out over three days and we returned on the fourth day to seal the floor with an initial two coats of Tile Doctor Colour Grow which is an impregnating sealer that enhances colour. 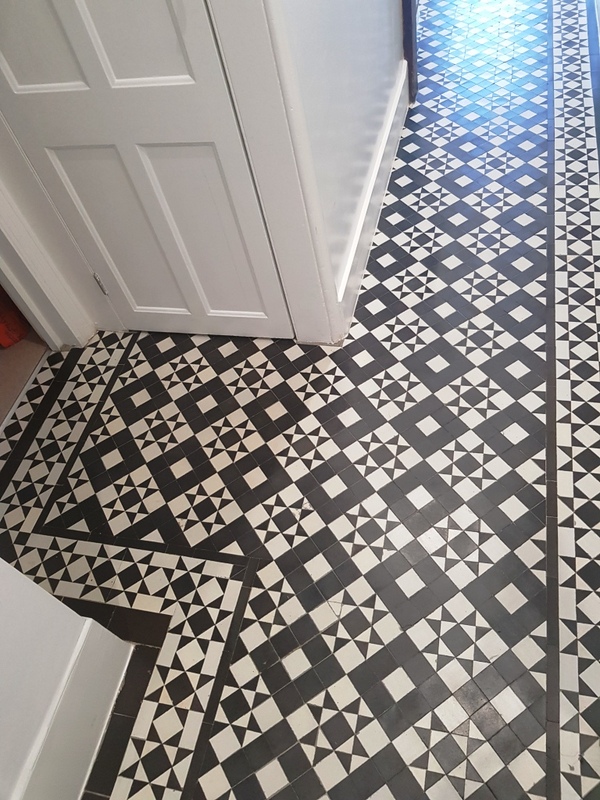 We then protected the floor for a further week with cardboard cut to size, this allowed other trades to finish their work without messing up the floor. 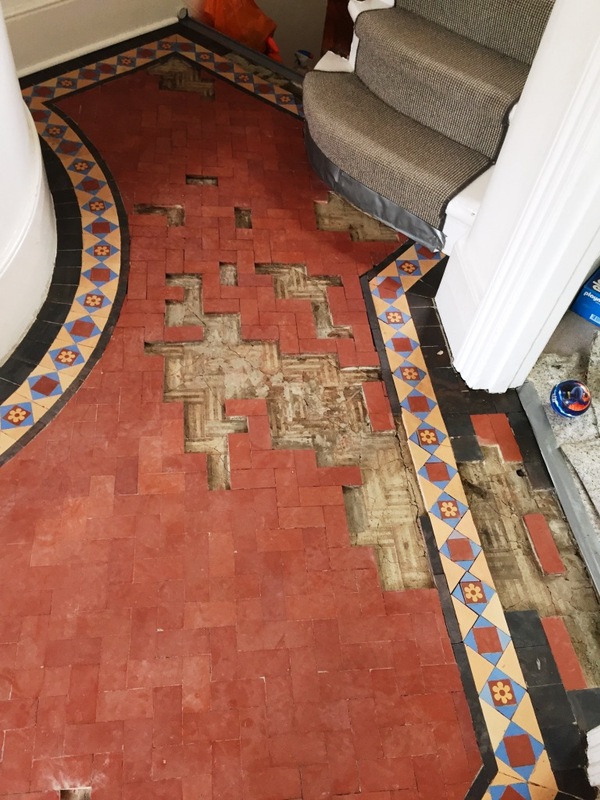 A week later we returned to lift the cardboard to apply the finishing seal using Tile Doctor Seal & Go which adds the final protection. 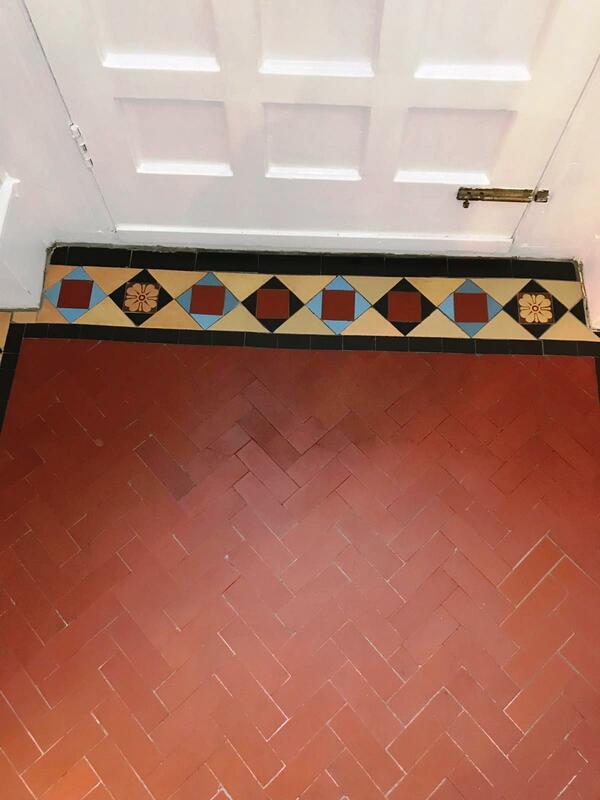 Five coats were applied to reach the right level of protection and desired satin finish restoring the natural appearance and lustre of the tiles. 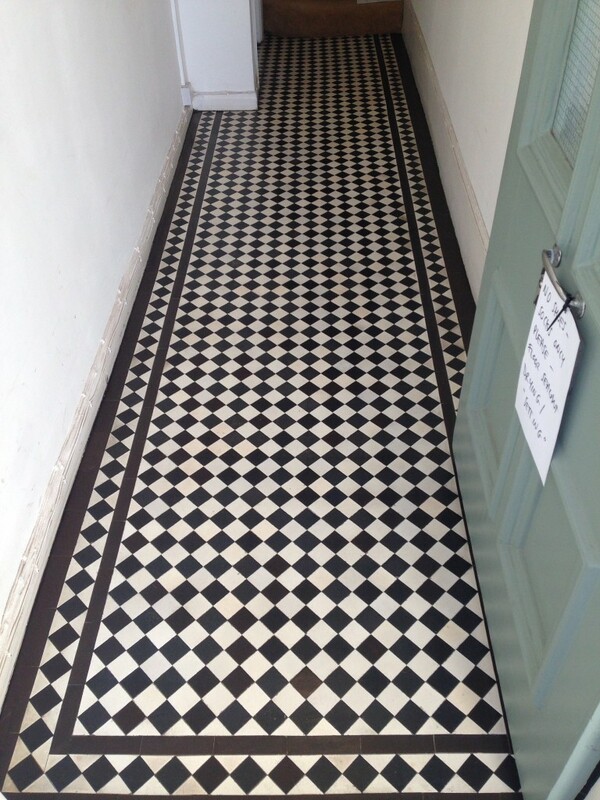 The whole job allowing for the drying times of adhesive, grout and sealing took five days in total. 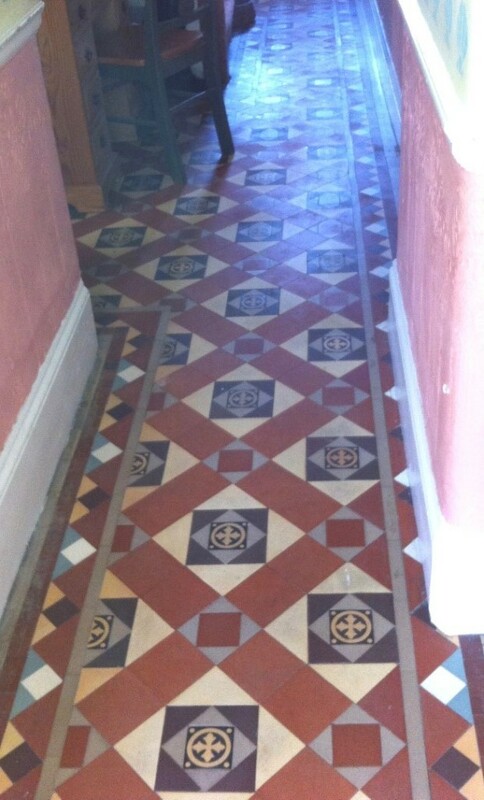 It was worth it though as restored Victorian hallway really gives the property the Wow factor as you enter. 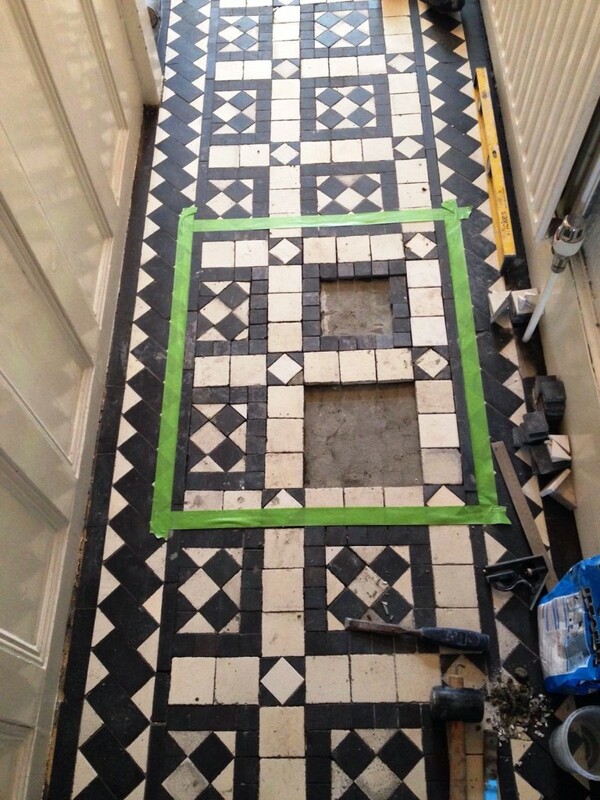 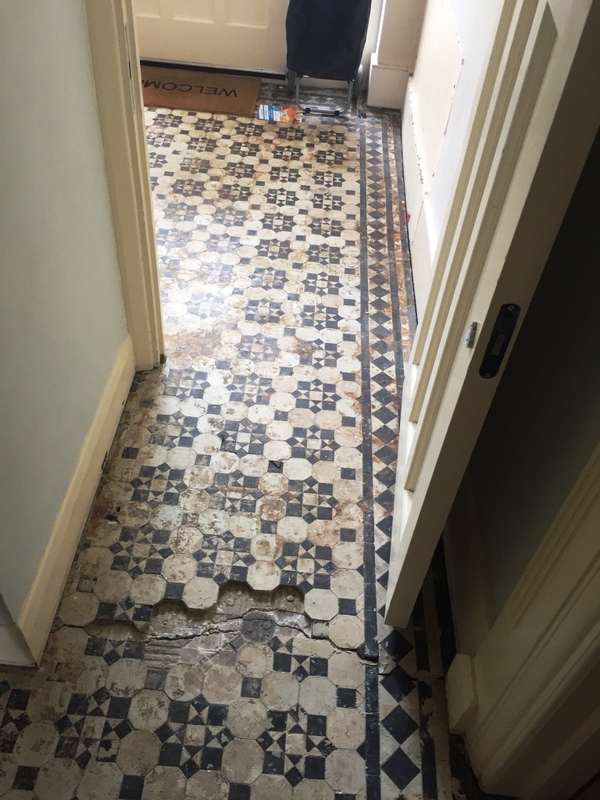 A customer in Islington had part of their Victorian tiled floor damaged due to building work and contacted us to ask if it was possible to restore it back to life as they didn’t want to lose such an original feature from their house. 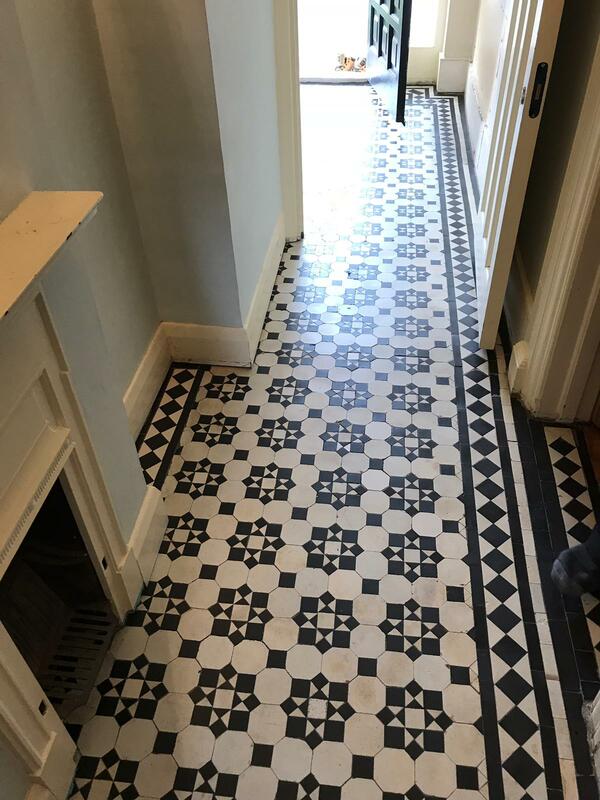 Victorian tiled floors are quite popular in the UK and we regularly complete restoration projects of this type so we were confident it could be restored. 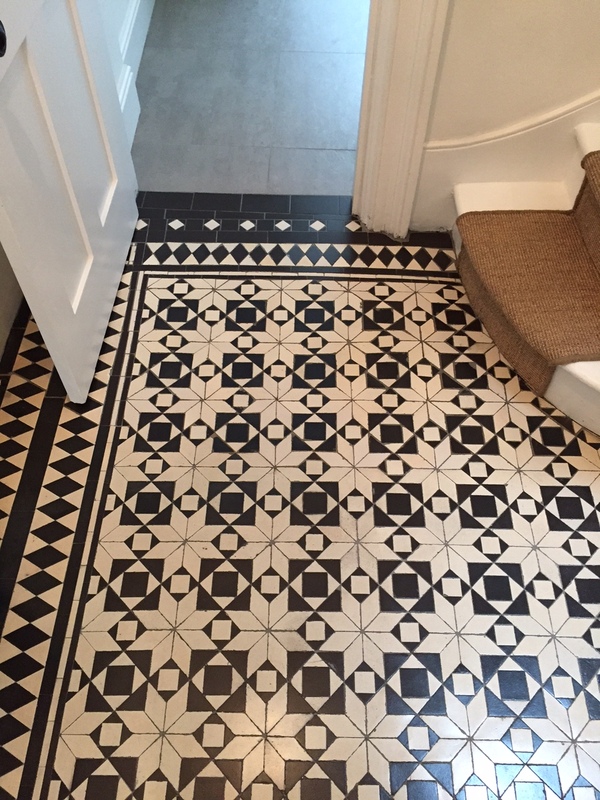 Finding replacement tiles was the key to restoring this floor however over the years we have built-up a list of UK suppliers who specialise in Victorian tiles so fortunately we were able to source a matching set and completely rebuild the area at the bottom of the stairs with replacement tiles. 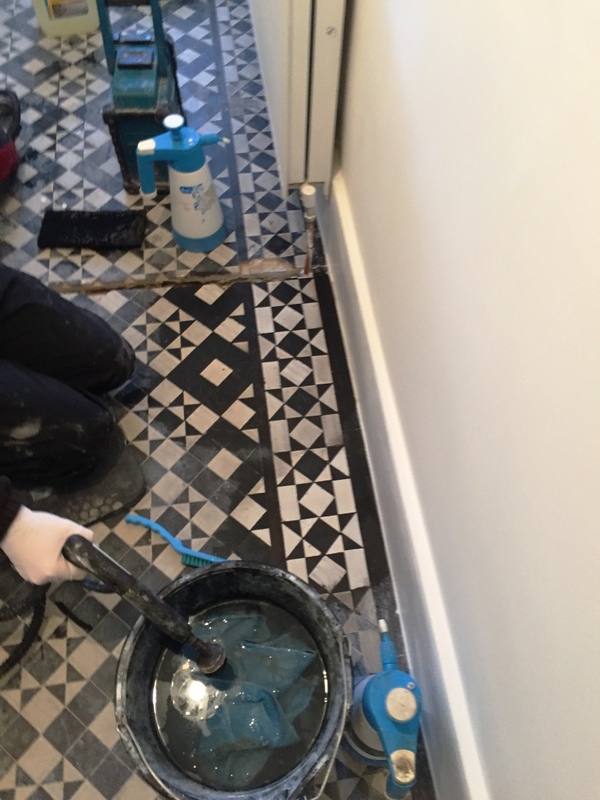 The next task was to set about cleaning the tiles using Tile Doctor Pro-Clean worked in with black scrubbing pads fitted to a rotary buffer machine. 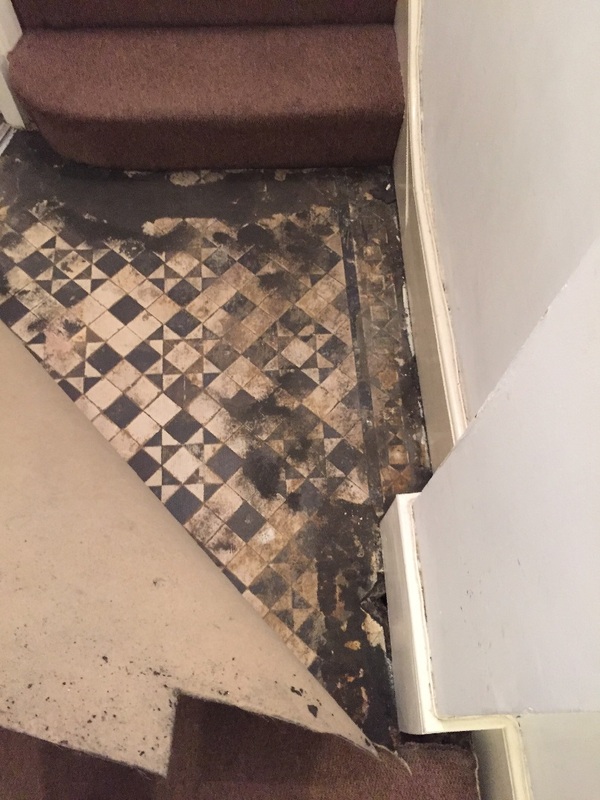 The soiled solution was then extracted using a wet vacuum and the floor rinsed with water. 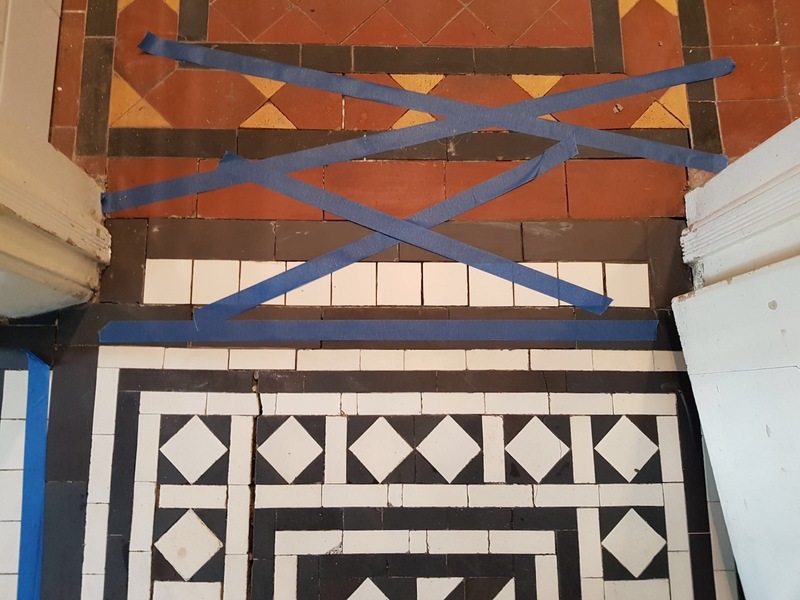 Final step of the cleaning process was to give the tiles an acid wash using Tile Doctor Acid Gel which removed old traces of grout and other mineral deposits such as efflorescence from the floor. 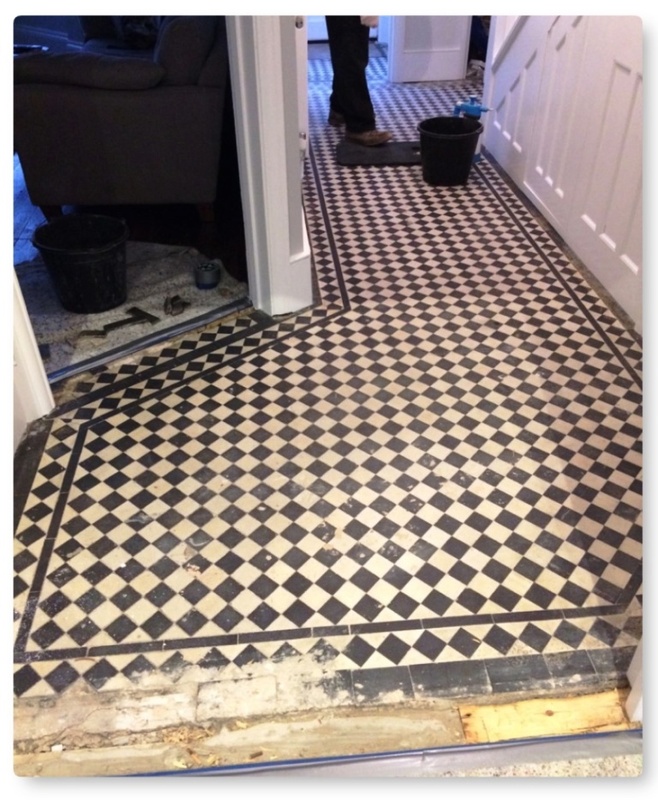 Once happy that is had done its job is was extracted from the floor and then the tiles were given a thorough rinse and left to dry off overnight. 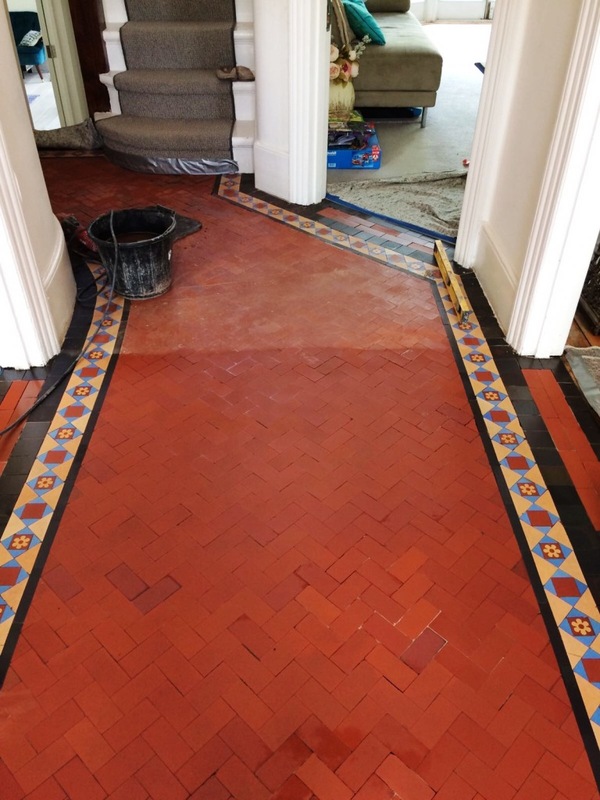 Next day we sealed the floor using Tile Doctor Colour Grow which is a breathable solvent based sealer, and is also very good at lifting the colours out of the clay tiles as providing a seal that will help protect the tiles from stains going forward. 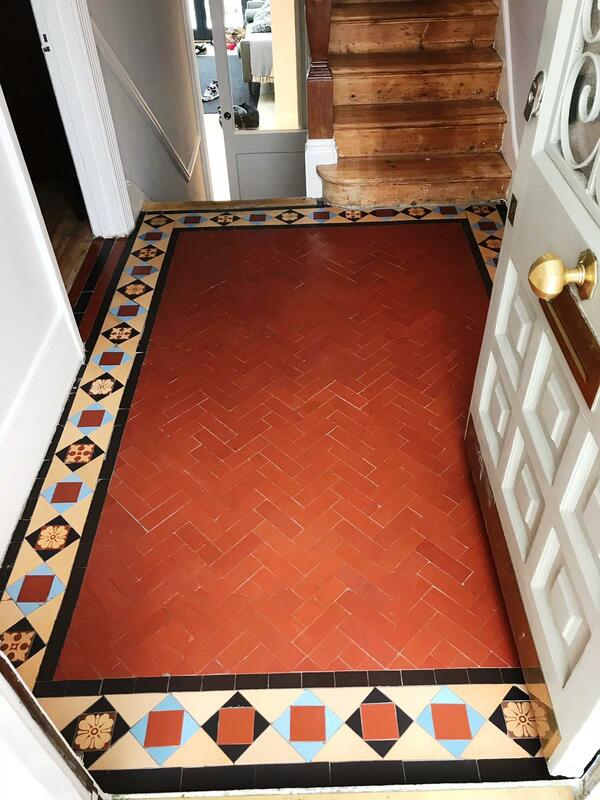 Another fantastic restoration completed and well worth the time that went into it, it’s great to see such a lovely feature in a house of this age which I’m sure adds value to the property. 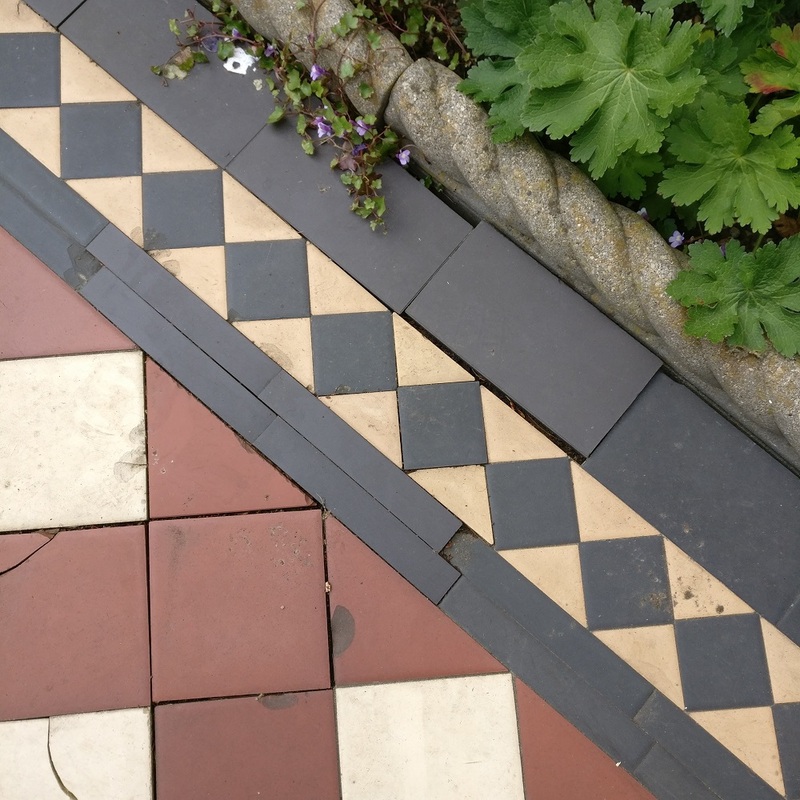 At first sight, this Victorian tiled pathway in Palmers Green, N13 did not appear to need too many repairs, with just a few obvious broken and loose tiles to be fixed. 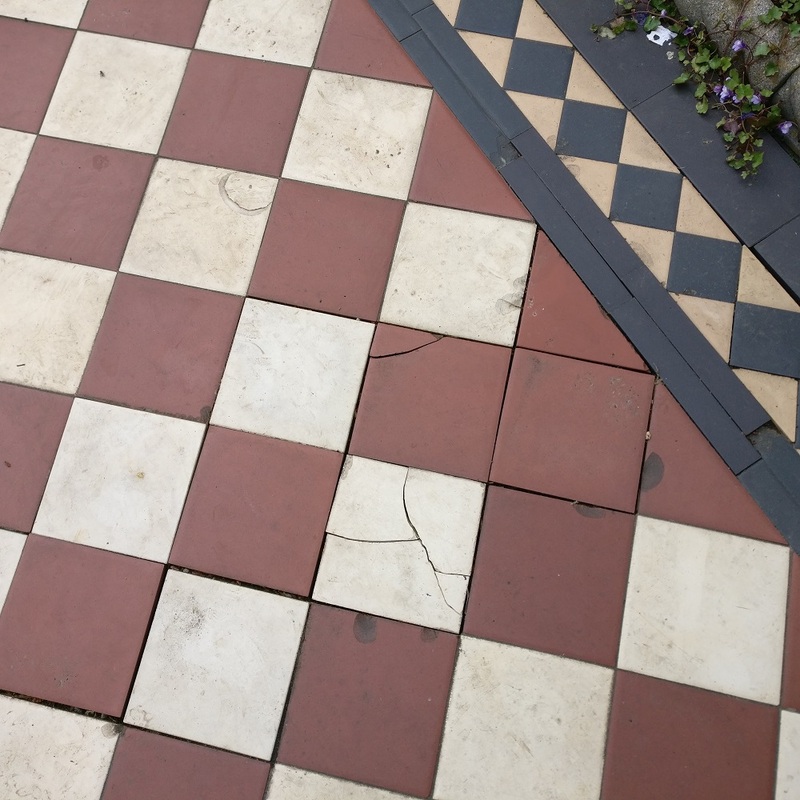 On closer inspection however it became clear it was in need of a deep clean and fresh seal. 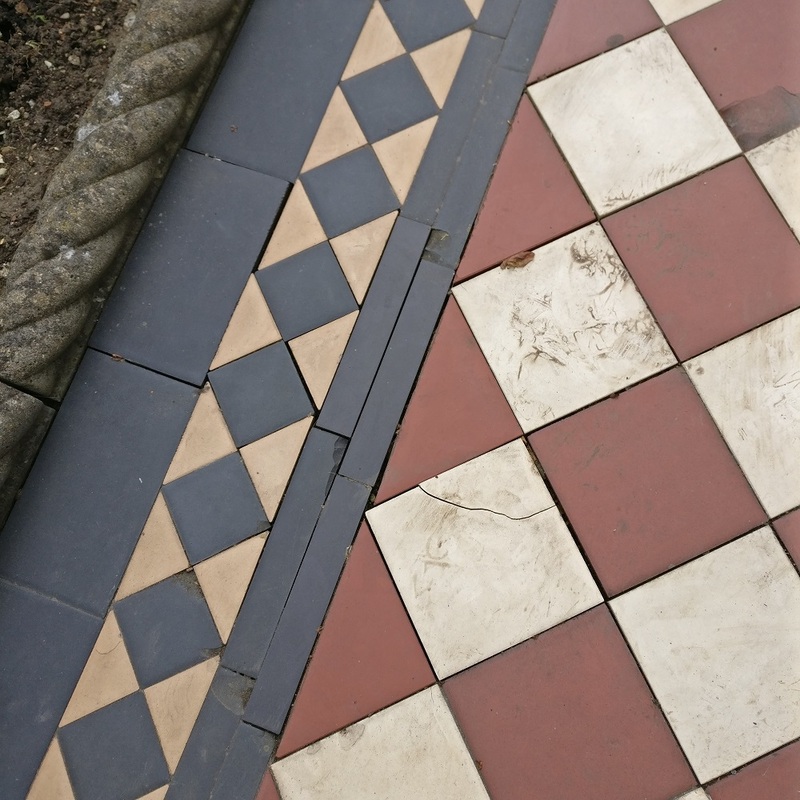 To start, we applied Tile Doctor Remove & Go across the entire length of the pathway to break down and strip off the old sealer and provide an initial clean. 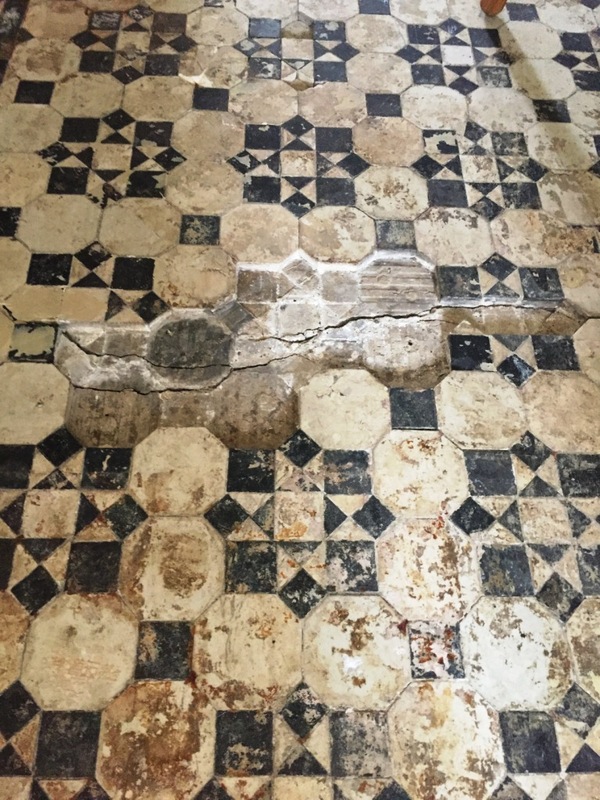 In the more stubborn and difficult to reach areas where we saw the buildup of efflorescence, we applied Tile Doctor Acid Gel to neutralise the alkaline salts. 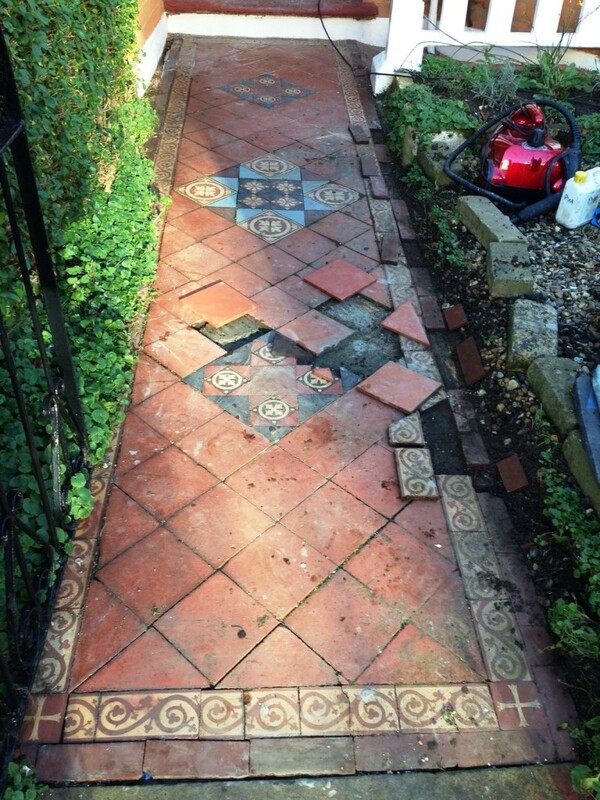 Acid Gel, as the name indicates, is a pH1 blend of Phosphoric and Hydrochloric acid in gel form, making it easier to apply to tricky areas, including sloped or vertical surfaces. 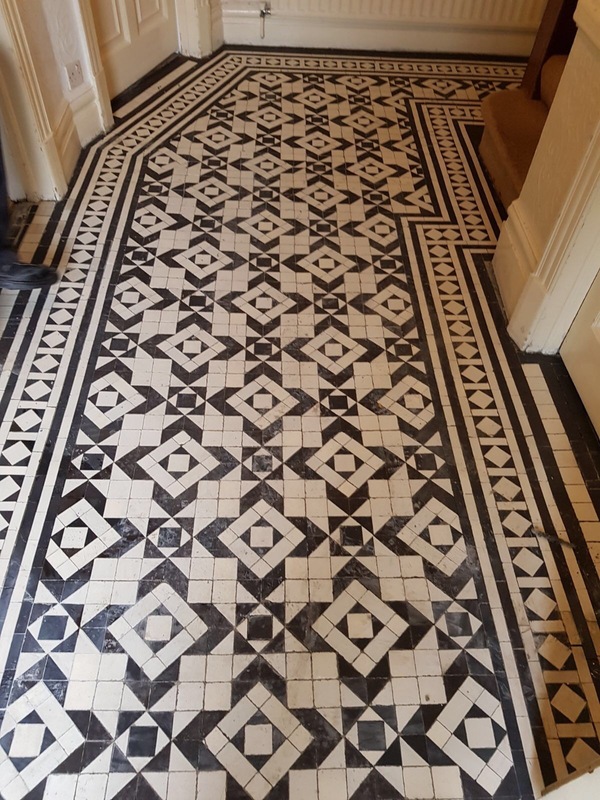 Users should be aware not to use this type of product on acid-sensitive stone such as Limestone, as this can cause etching if left on too long. 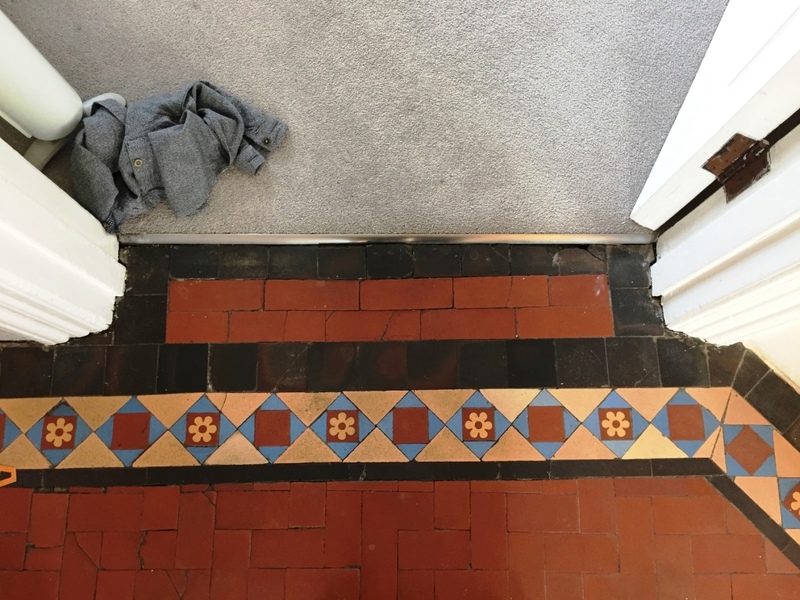 Once the dirt and efflorescence buildups had been dealt with, I focused my attention towards the tile repairs, quickly realising that the extent of damage was greater than initially thought. 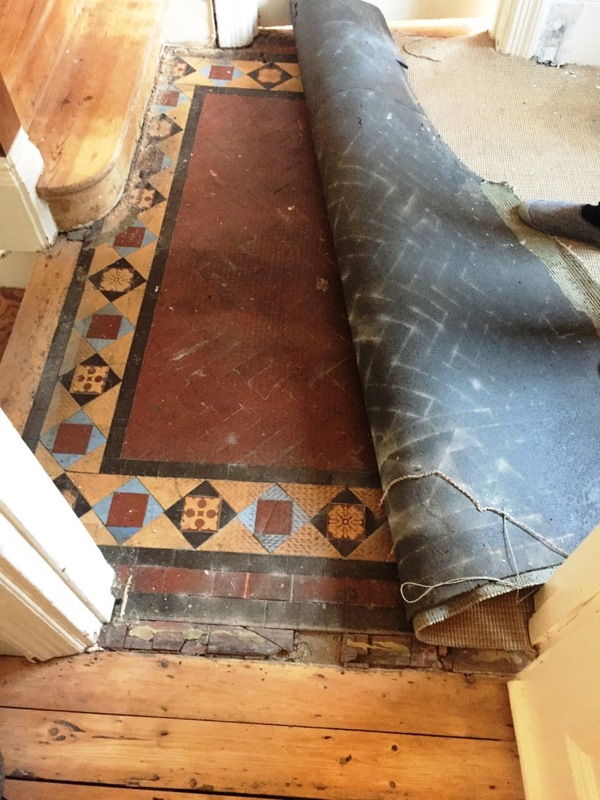 Firstly, the numerous loose and broken tiles were removed and individually cleaned in a similar way to the rest of the floor. 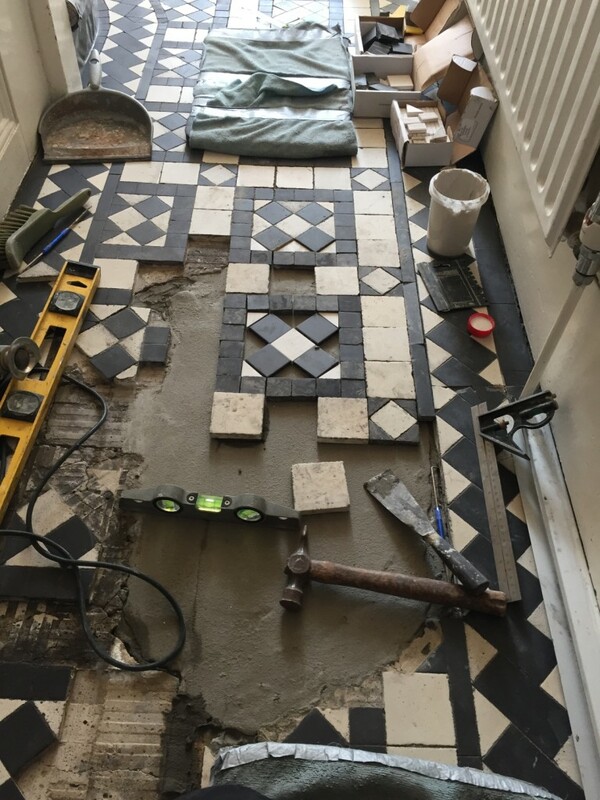 We then repaired the sub base ready for the existing and newly sourced tiles to be re-laid, before leaving the floor to set and dry overnight. 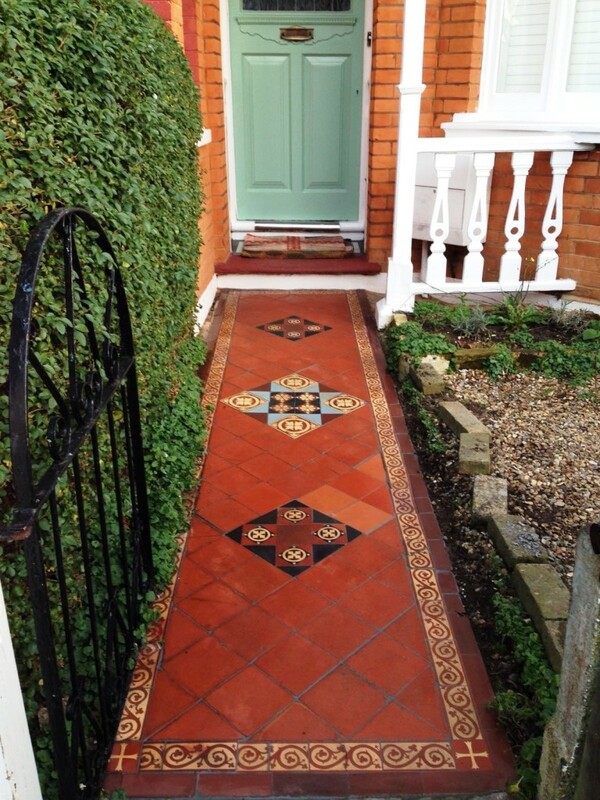 The next day, the pathway was grouted, before being sealed with Tile Doctor’s colour enhancing, impregnating sealer, Colour Grow to bring back the life and character to the Victorian tiles. 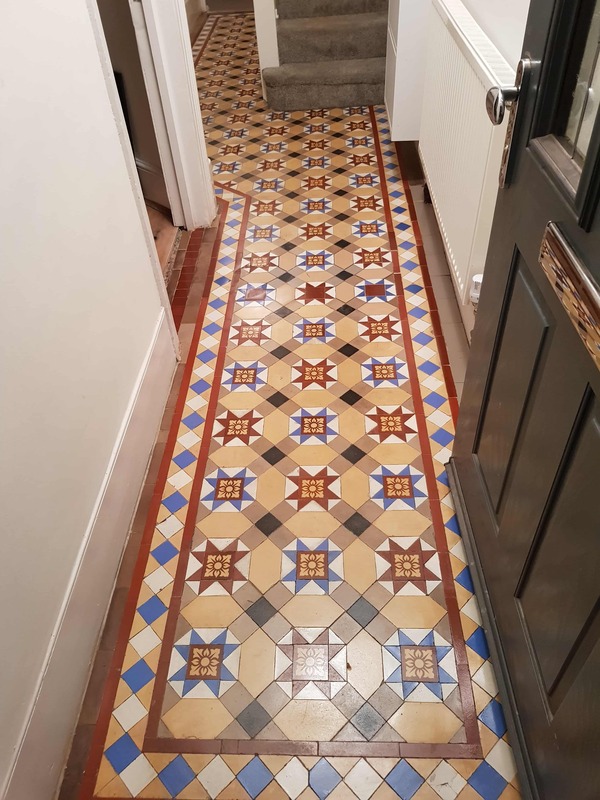 I was also asked to renovate the Edwardian hallway tiles in the house so once finished with the pathway they were deep cleaned using a strong dilution of Tile Doctor Pro Clean. 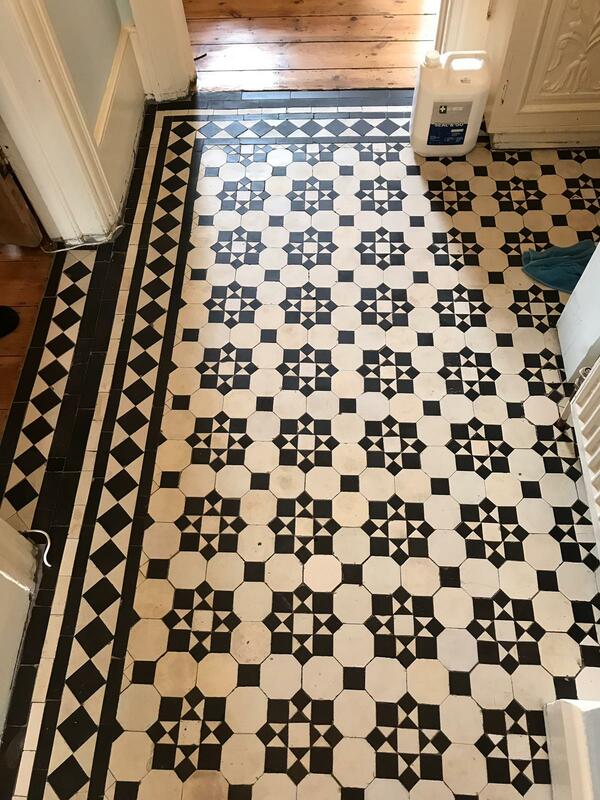 This also helped to break down the old sealers and waxes – followed by a careful cleaning of the grout lines using Tile Doctor Grout Clean Up in combination with 3m black pads and detail brushes. 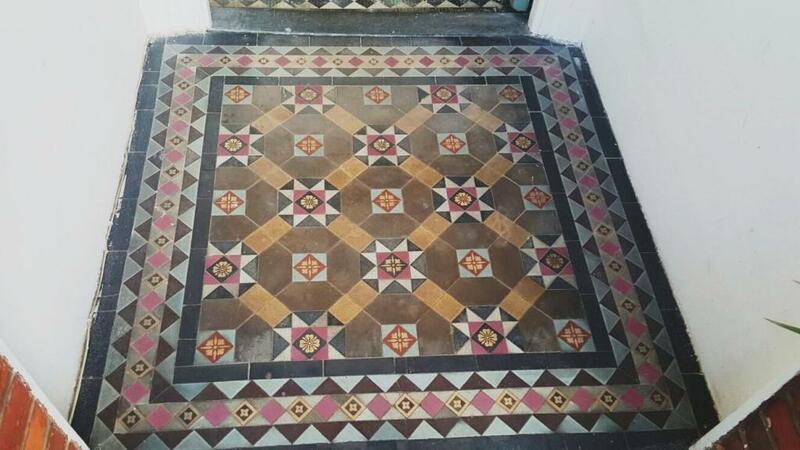 To ensure any pre existing sealer was completely removed, I followed up with a steam clean and left the tiles to dry overnight. 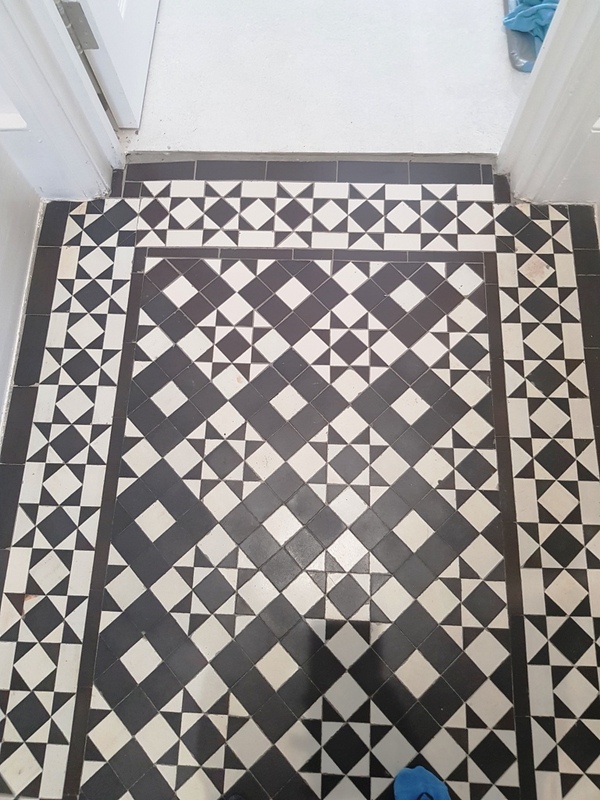 Upon my return to the property the next day, I completed re-grouting in the necessary areas, before sealing the tiles with five coats of Tile Doctor Seal & Go, providing an aesthetically pleasing satin finish. 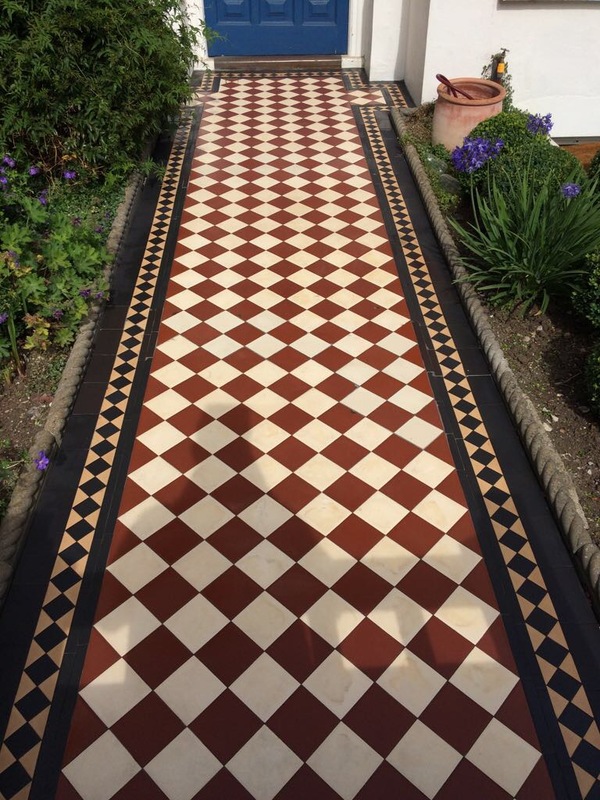 Seal & Go is a topical, solvent-based sealer which forms a layer of durable protection on the surface of the tiles, protecting against dirt and stains. 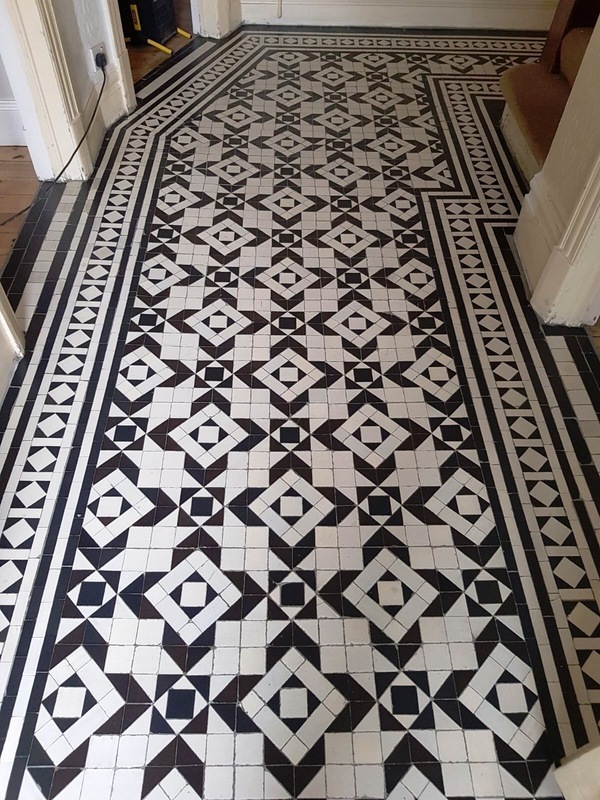 This Victorian floor was discovered at a house in Swiss Cottage in the London borough of Camden when the current owner took the old carpet up. 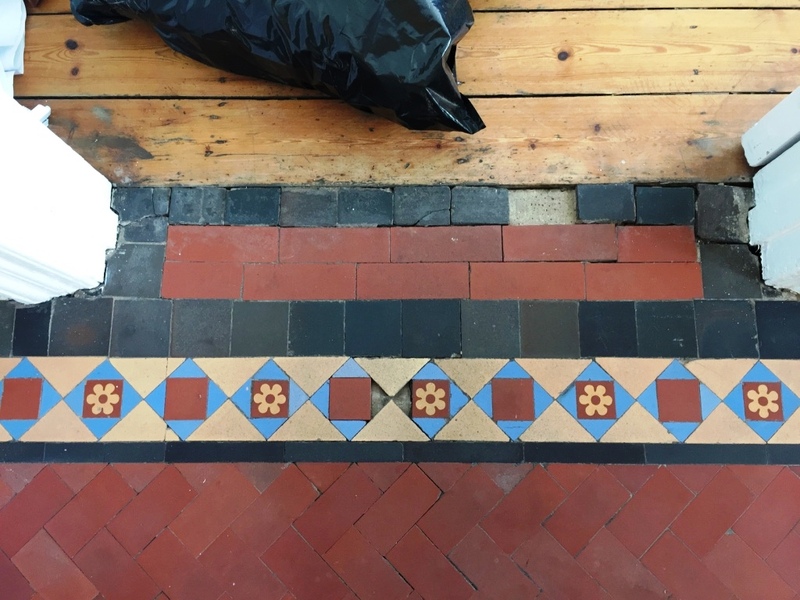 It was in need of substantial restoration to bring it back to its former glory however we have had really good results from restoring similar floors so we were confident it could be done. 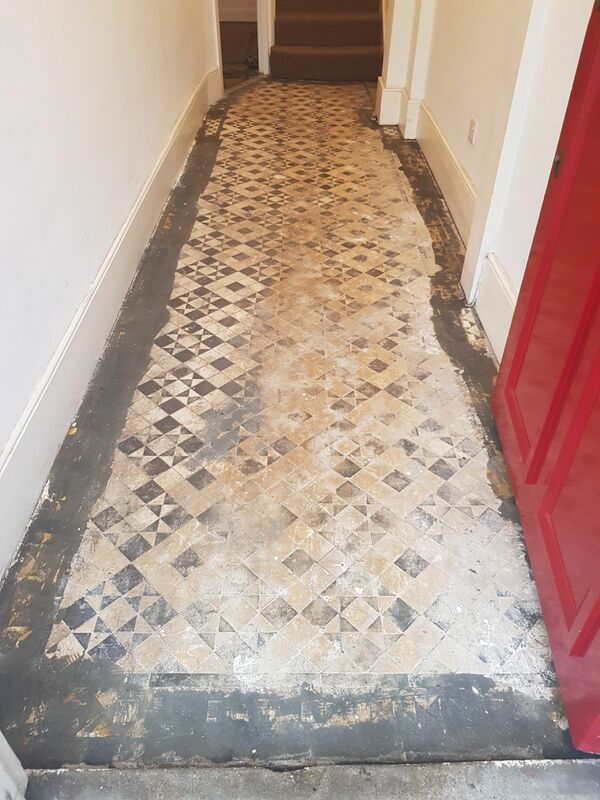 The carpet had literally just been taken away so we had to remove the gripper rods, underlay and deal with the adhesive which we managed to tackle using a strong solution of Tile Doctor Remove and Go which was left to dwell and penetrate the glue for ten minutes before being scrubbed in. 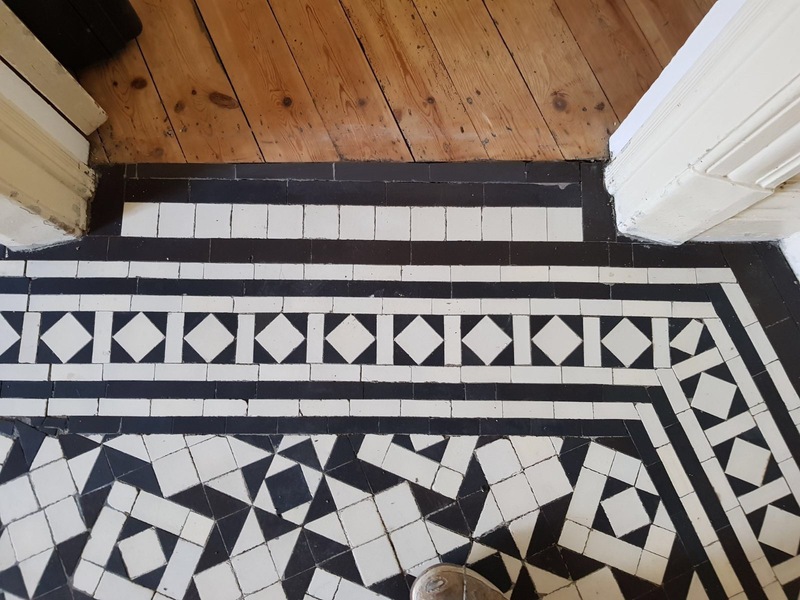 Once the glue was removed the tiles were given a thorough clean using Tile Doctor Pro-Clean using the same process of leaving it to soak in and then actively scrubbing it into the floor to get the tile and grout as clean as possible. 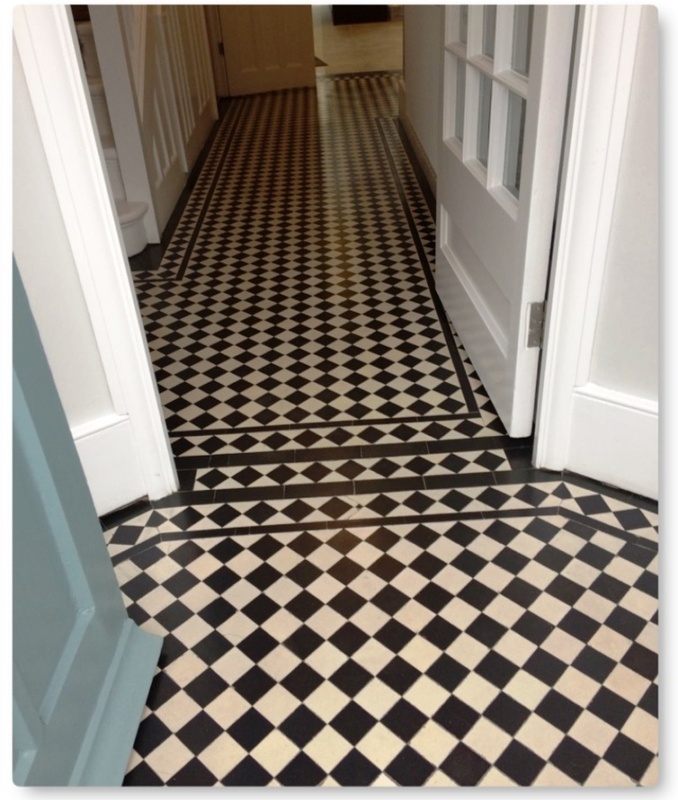 The floor was then rinsed and stubborn areas re-treated until we were satisfied with the result. 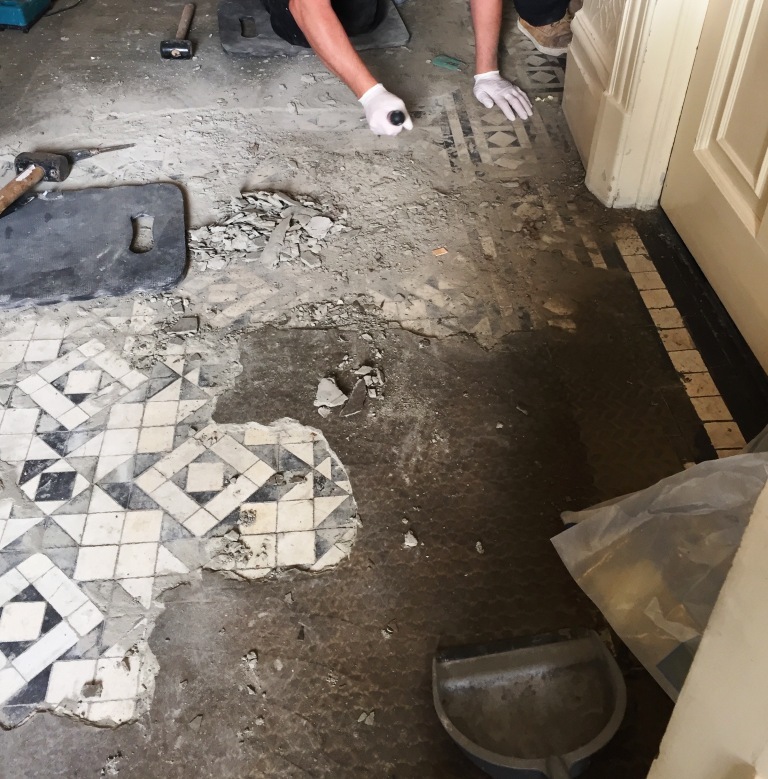 The last cleaning step was to use a steam cleaner to pull as much dirt out of the pores of the tiles as possible and a wet vacuum to extract the liquids and get the floor as dry as possible and we also re-grouted where necessary due to the damage caused by the gripper rods. 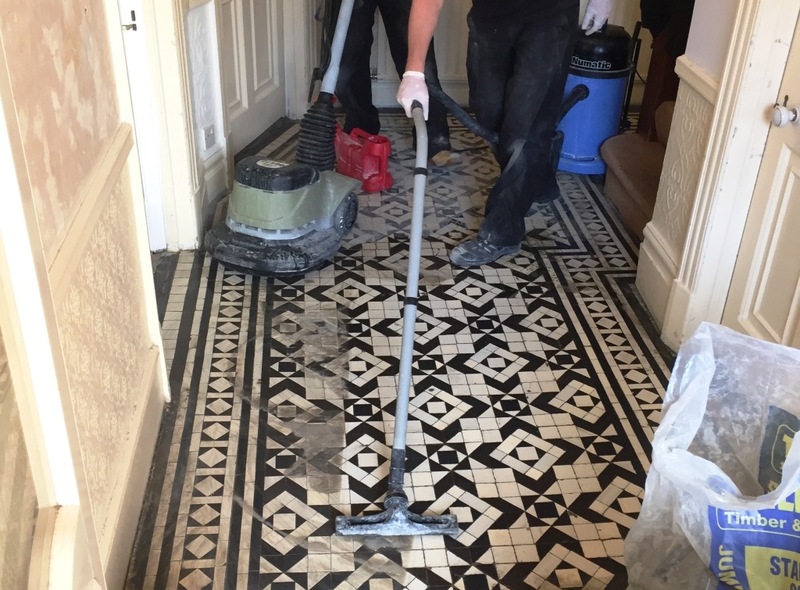 We also gave the Victorian tiles in the entrance lobby a thorough clean using the same process, although they had not been covered in carpet they were still in need of a deep clean. 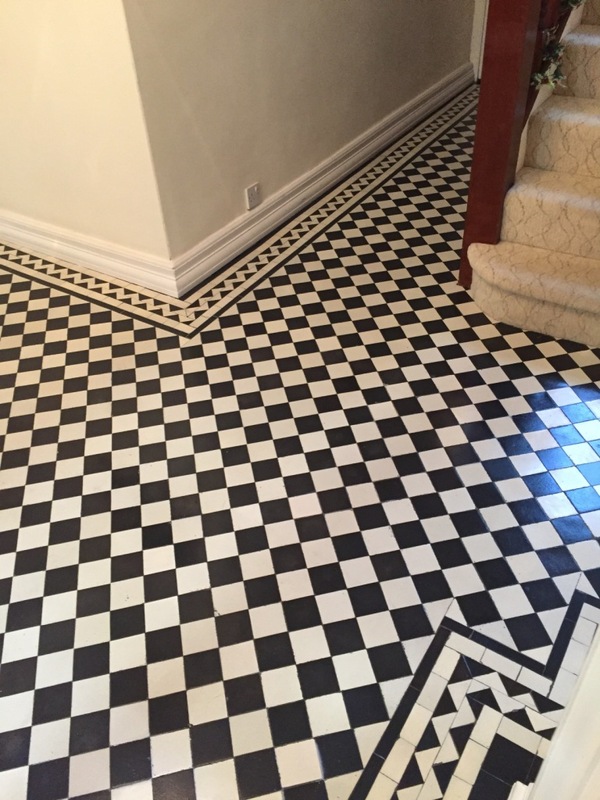 The floor was left to dry and when we returned the whole floor was ready to be sealed and for this we used five coats of Tile Doctor Seal and Go which adds a nice shine to the floor as well as providing a surface seal that will help protect the tiles from stains going forward. 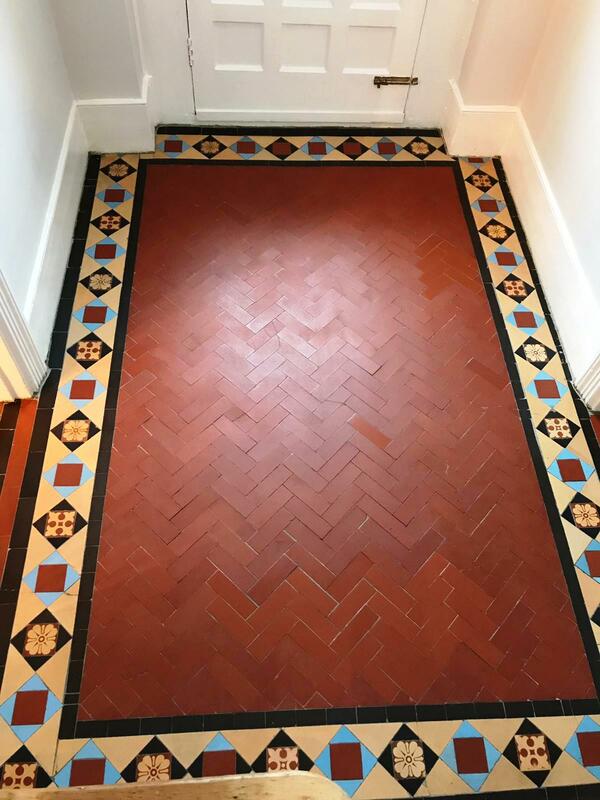 For the entrance lobby we used two coats of Colour Grow which doesn’t add the shine but as an impregnating sealer we felt it would perform better with the wear at the front of the house. 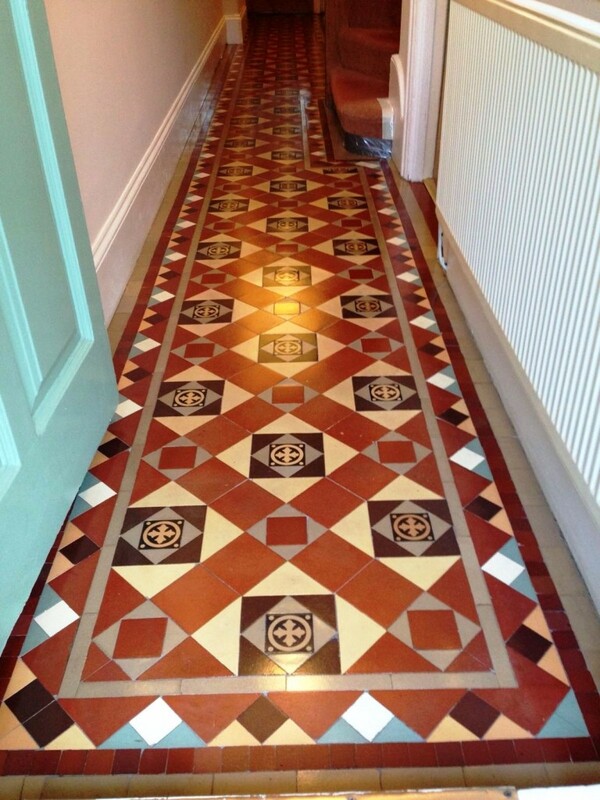 Prompt, courteous, hard working and great results !. 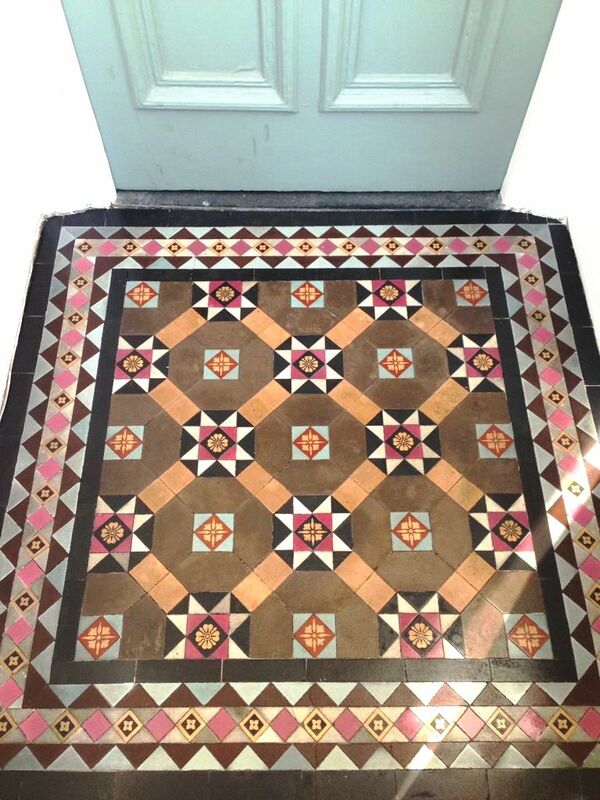 The photographs below are from a Victorian tiled hallway floor at a property in Stoke Newington in London. 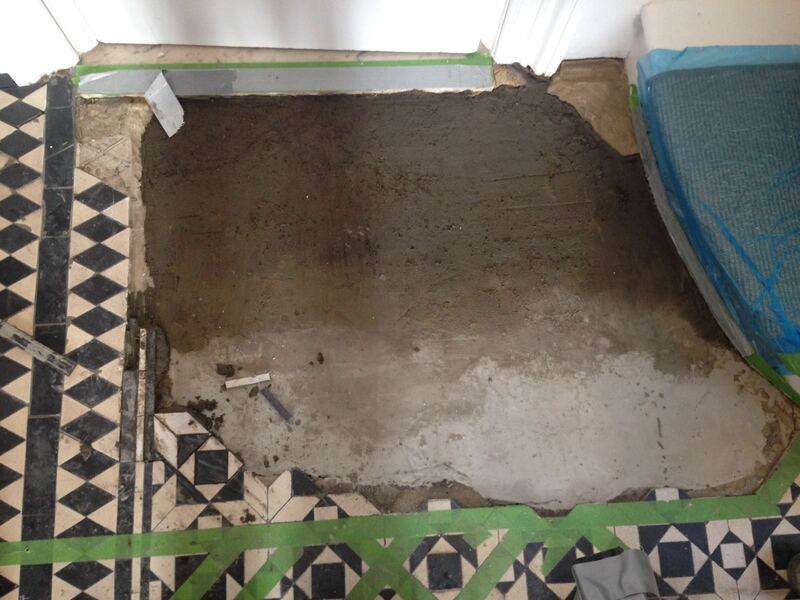 The floor was in need of repair with a large area very uneven and partly sunk in the middle of the pattern. 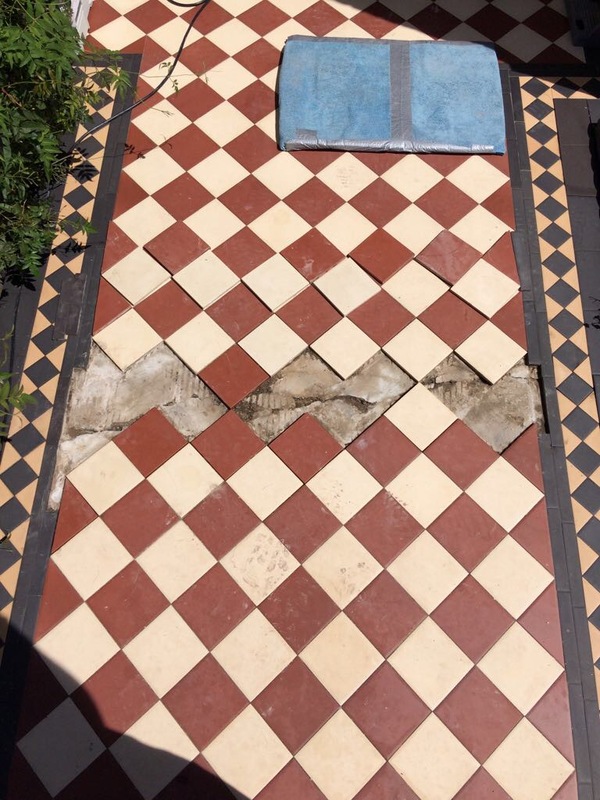 The repairs were made using as many existing tiles as possible. 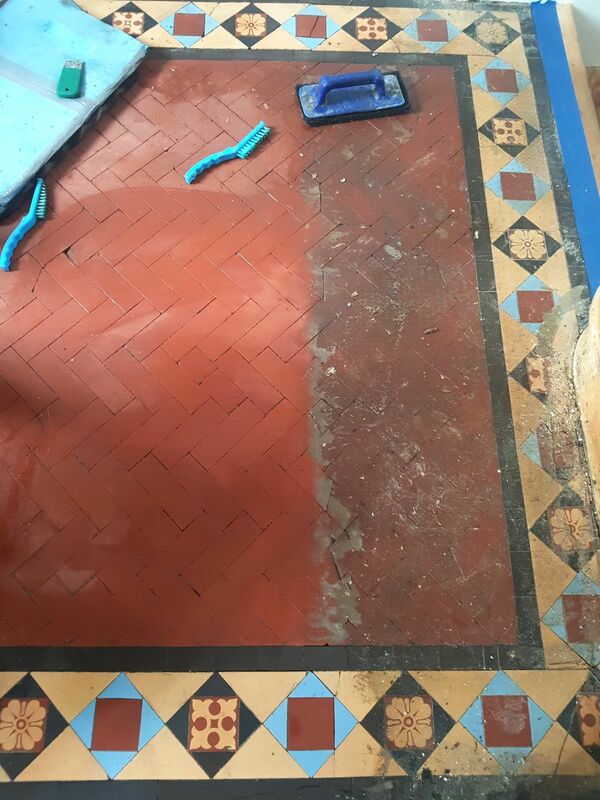 The first task was to set about cleaning the tiles using Tile Doctor Pro-Clean and Remove & Go on the stubborn areas. 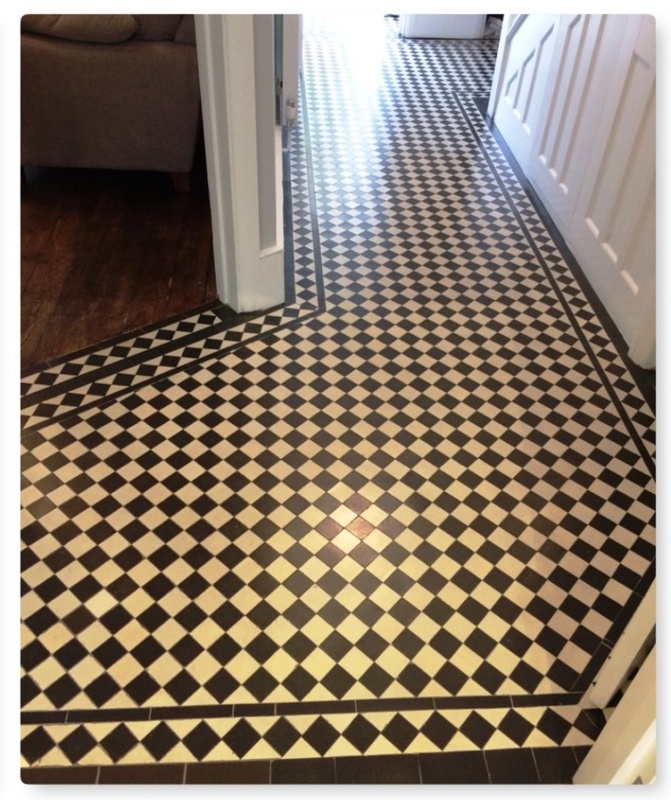 Both products were applied in the same way using black scrubbing pads to work the products into the tile to release the dirt. 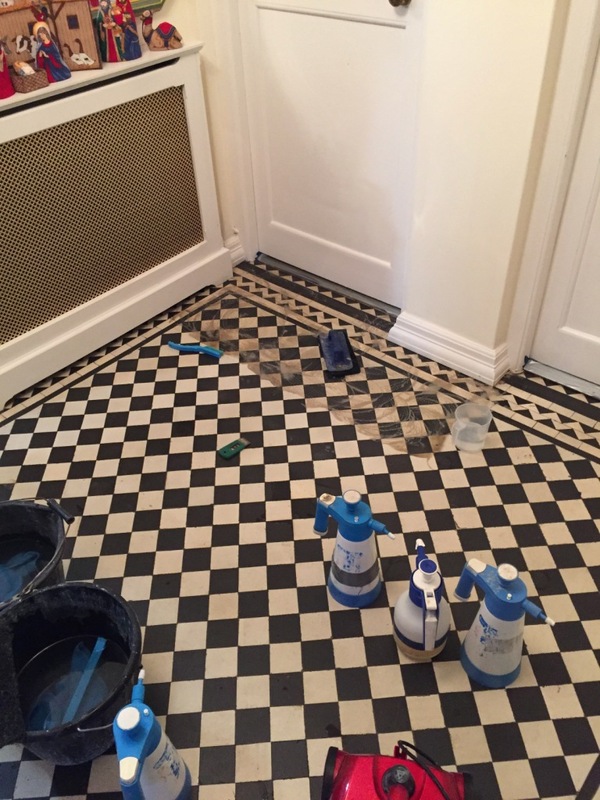 Hand brushes were used to clean up the grout lines and the floor was rinsed and soil removed using a wet vacuum. 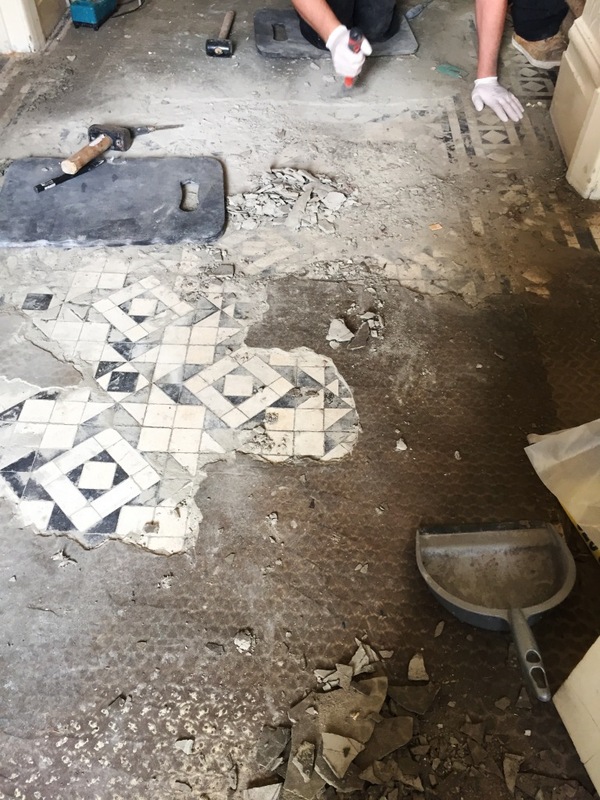 At this point the large loose area of tiles were removed to be cleaned of grout/adhesive for use later and the sunken area that was revealed was levelled in line with the rest of the floor base. 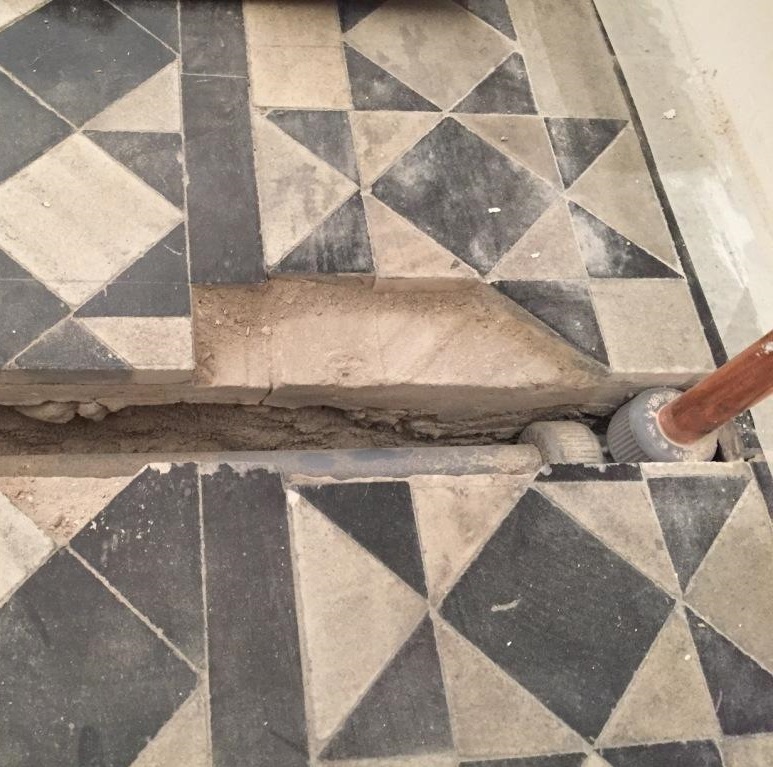 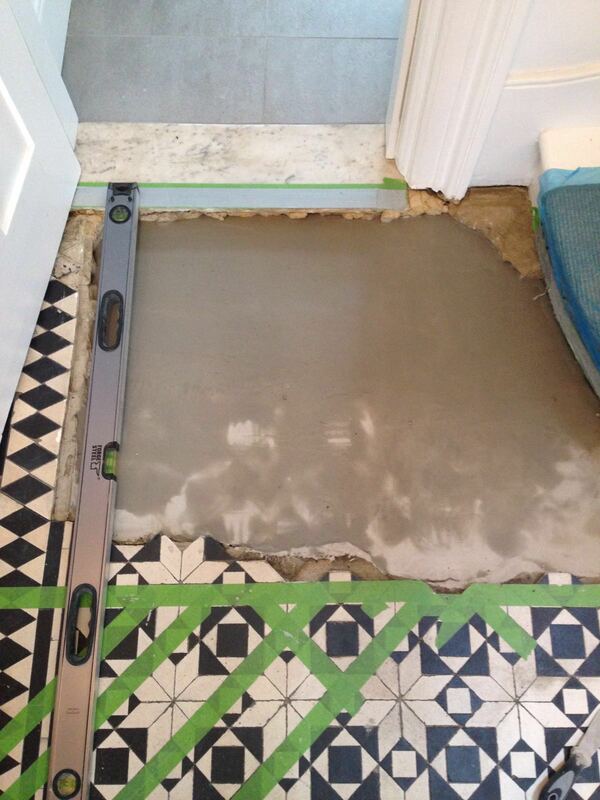 Once the new cement base had set and the tiles useable again they were re-laid and set in position to fit the matching pattern of the remaining floor. 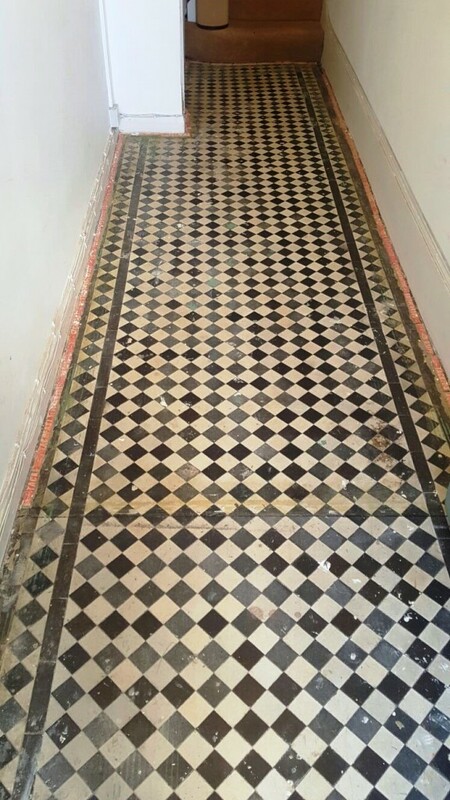 Once the tile adhesive had set the last thing to do was to re-grout the repaired area making the hallway whole again and left to go off. 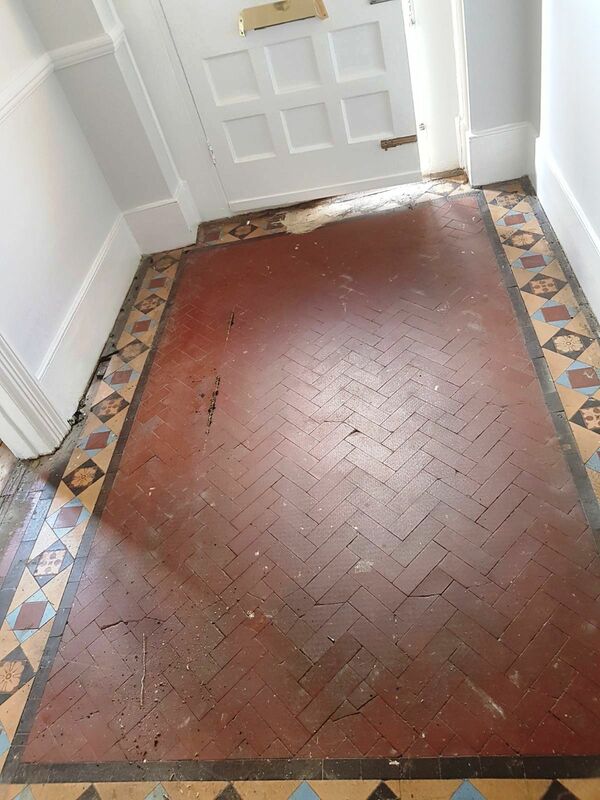 When we returned the whole floor was ready to be sealed and for this we used five coats of Tile Doctor Seal and Go which adds a nice shine to the floor as well as providing a surface seal that will help protect the tiles from stains going forward. 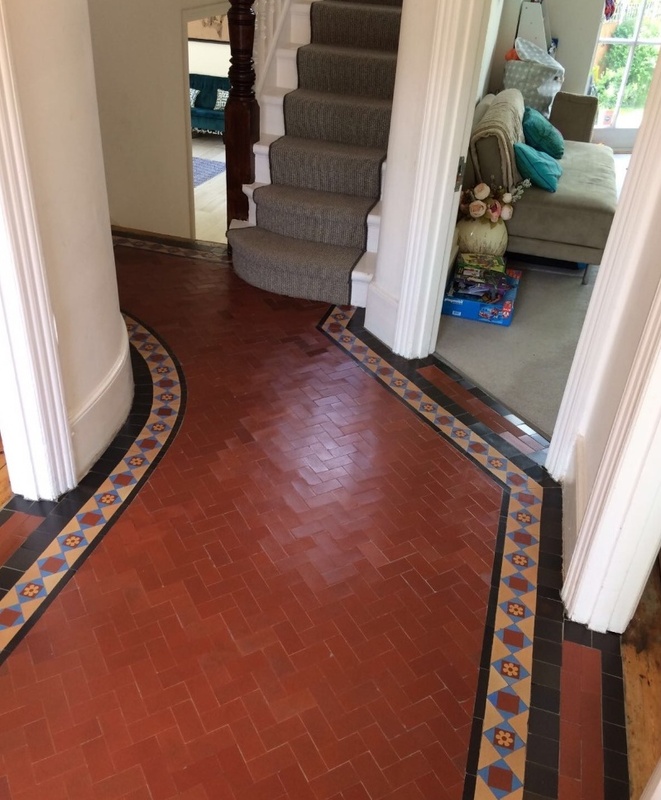 A lot of effort went into the restoration but what a transformation and well worth the work, certainly the customer was pleased and left the following testimonial. 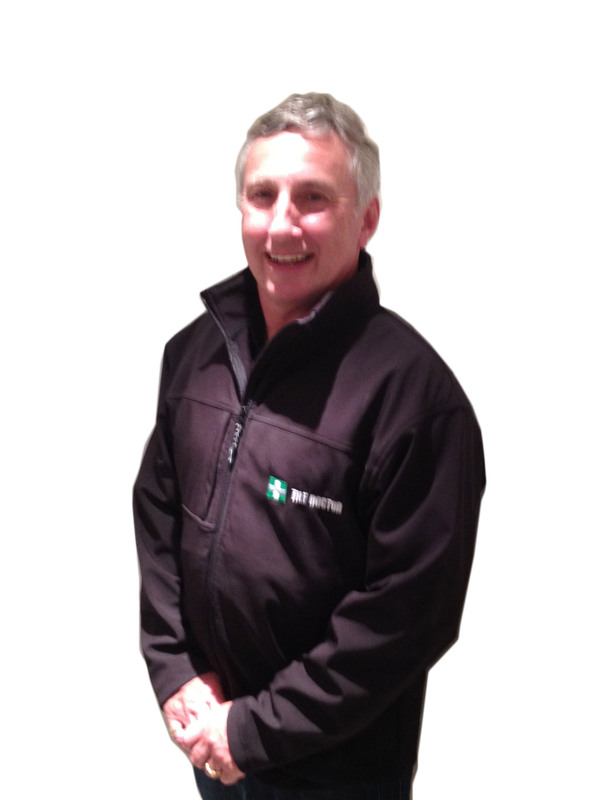 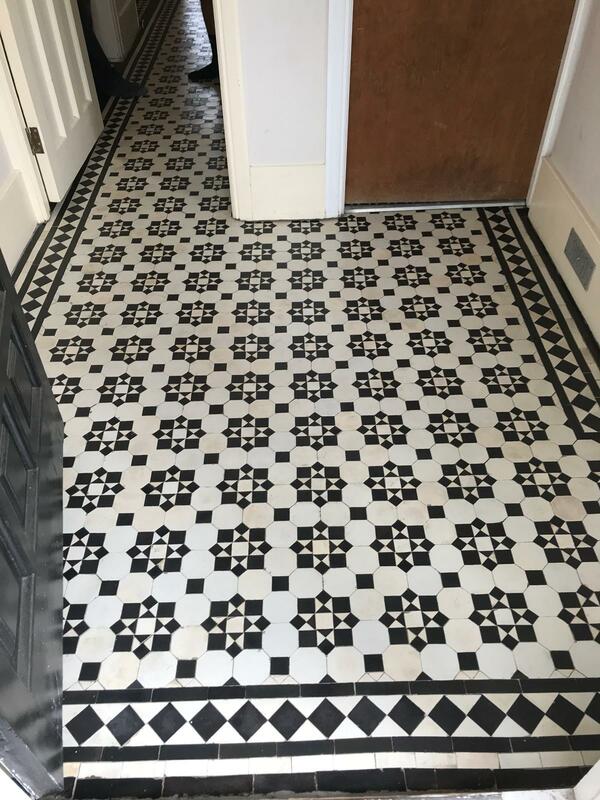 Rob Voyce responded very quickly to my request for a quote, and was able to complete the work to a very good standard in the agreed time. 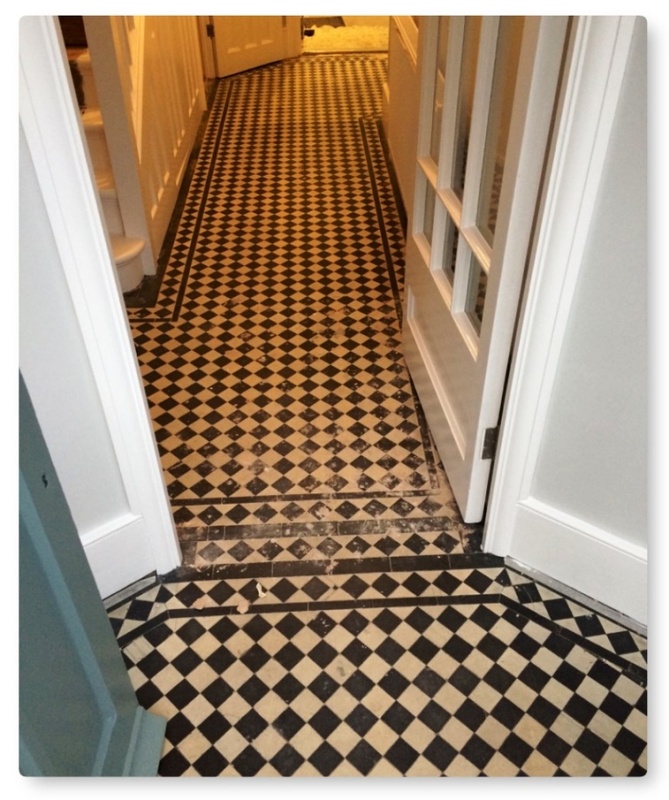 The work caused minimum disruption to the household and everything was left clean and tidy at the end of each day. 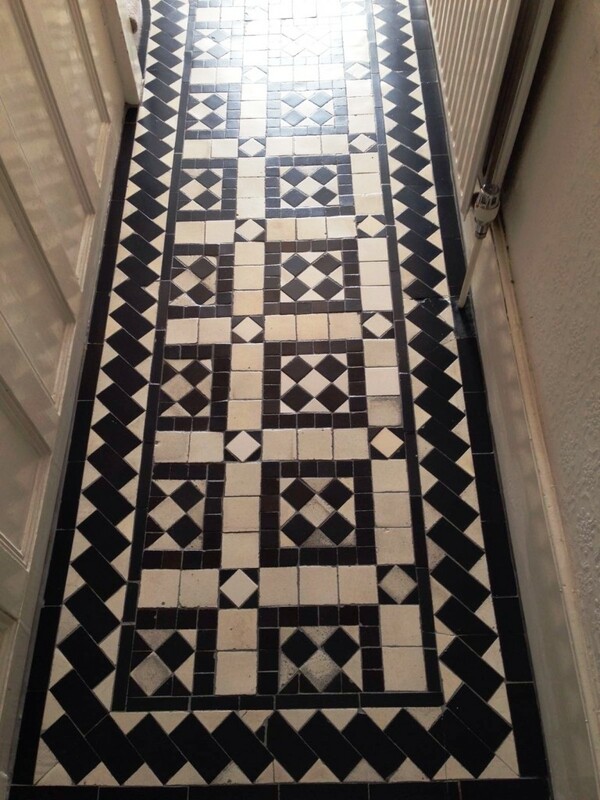 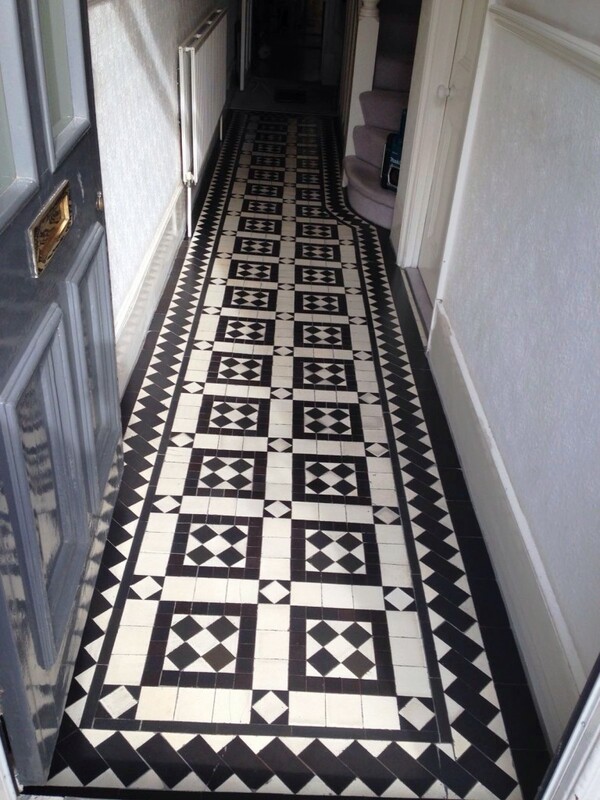 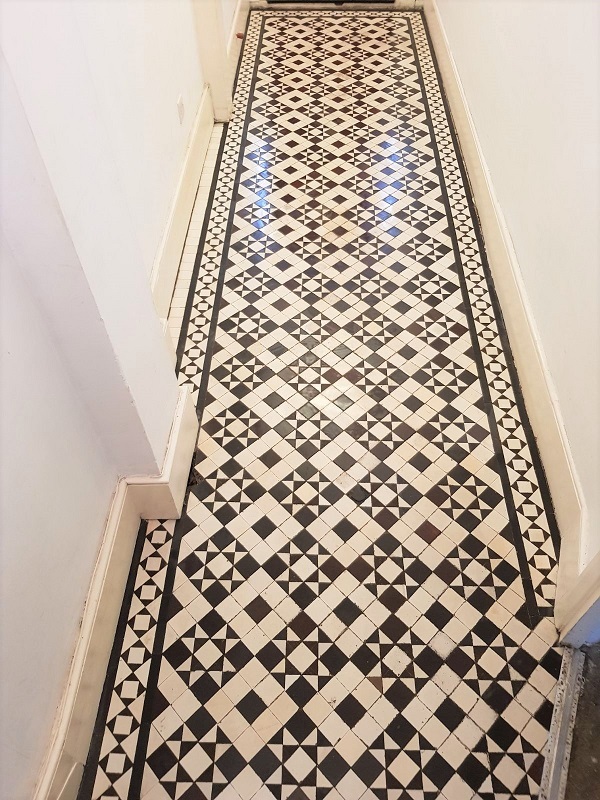 I would certainly recommend the services of the Tile Doctor and I am very happy with the work that has been done on old tiles in my Victorian hallway.